When I previously mentioned that my plans in Paris were to have no plans, I wasn’t kidding. Looking back at all we did while in this beautiful city proves that. I am a planner by nature. I love the actual exercise of planning things out – whether that be a vacation, a dinner party, weekly meal prep, a weekend spent cleaning. I will make a plan (and a list, of course!) and go at it. Basking in the sun, eating leftover jambon et beurre sandwiches from the day before, journaling, and observing our fellow Parisians act out the joie de vivre (we were living in an apartment in Paris so we naturally considered ourselves Parisians for six days). Sounds pretty perfect because it was. What we missed out on during this excursion: floating our own toy sailboat around the large pond, and going on a run along the paths criss-crossing these beautiful gardens. Although it’s probably a good thing we didn’t bring along our running shoes because we later learned there are numerous rules for runners here and we probably would have succeeded in breaking every single one of them. Disaster avoided by our vacation mode (aka lets-bring-workout-clothes-with-us-on-vacation-so-we-can-run-every-day-but-never-actually-unpack-said-clothes mode). Do an online search for “famous Paris cafes” and the top two results will be Les Deux Magots and Café de Flore. These neighboring cafes opened their doors in the late 1800’s and were frequented by many literary and artistic famous (or not yet famous) throughout the early to mid 1900’s: Pablo Picasso, Ernest Hemingway, James Joyce, just to name a few. They are now popular tourist destinations due to their long history and their past patrons. We strolled to this part of the city one day and decided to grab an outdoor table at Les Deux Magots. What a lovely lunch we had! It was quite a warm day so we both wanted something light and refreshing. The salads we ordered did not disappoint! They were both huge, filling and delicious! The large chocolate macaron we ordered off the dessert tray was delicious as well, but it’s 14€ price tag took some of the sweetness away (we didn’t know how much it was until we received our bill 😛 ). Paris, and all of Europe, has some incredible, architecturally brilliant and beautiful sights. The Parisian “look” in particular is something so iconic and something I absolutely love. 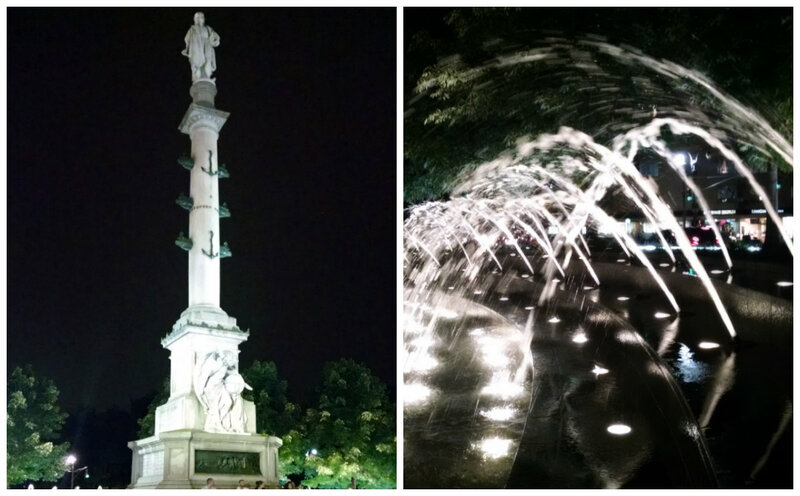 We strolled all over this city and saw so many famous and not-so-famous buildings, monuments, bridges and parks. The Eiffel Tower. I’m pretty sure this is one of, if not the, most recognizable monuments in the world. And for very good reason. I don’t think you can comprehend just how large this tower is until you’re standing underneath it. Or viewing it from afar as it literally towers over and dwarfs everything surrounding it. We visited la tour Eiffel twice during our visit: once during the day and once at night. Both were lovely (although we were freezing during our evening trip there). The apartment we stayed in was in the Montmartre area of Paris so we were close to the Sacré-Cœur Basilica. We visited this church a few times during our stay and it’s magnificent. We had planned on climbing to the top of the basilica one morning to watch the sun rising over the city, but after waking up at the crack of dawn and making the hike up to the church, we were informed that the dome didn’t open until 9:00. Sad face. We still had a nice view of Paris from this vantage point and it was so, so nice walking through this busy city in the quiet, peaceful, early morning. France is a food lover’s dream come true. And I think 85% of my diet during my nearly three weeks in France was made up of some form of bread. I just can’t say no. Not in France. We had some amazing food while in Paris and I even cooked dinner one night in our apartment (bucket list item checked off – cooking a meal in Paris). While in France I threw caution out the window and just went for it. All of it. Give me all the food. So, so, so good. Paris has my heart and it always will. These few days I spent there just whetted my appetite for more and I already can’t wait to return. It was sixteen years between my first and second visit to New York City, but only one year between my second and third. 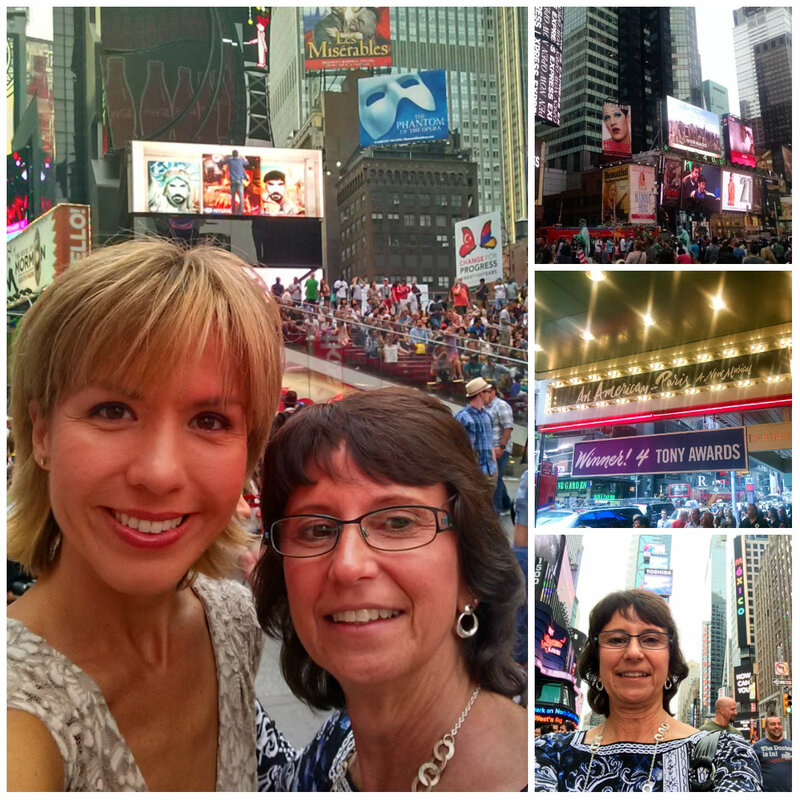 Last summer I again found myself in the Big Apple – this time with my friend, Teresa, who was celebrating a very special birthday by visiting this crazy city for the first time. I was super excited to be able to see, do and eat more here after visiting the previous summer. And, amazingly enough, I didn’t see, do or eat one thing that I did the year before! Just goes to show you how much entertainment (and food!) this city enjoys! Our week started on a Friday and after arriving, taking a train into the city, and checking into our Airbnb accommodations, we headed out to grab some grub. We decided to get our obligatory visit to the Hard Rock Cafe out of the way first thing. This one is located in Times Square and is huge! Next on the agenda was a trip to the TKTS booth to purchase discounted tickets to a show that evening, which is the perfect way to start a visit to NYC. 🙂 We ended up seeing Something Rotten and it was fantastic!! So, so funny – definitely the funniest musical either of us have ever seen. Highly recommend! What a terrific tour! This is the second “foodie” tour I’ve taken – the first being in Vancouver – and I really think I’m going to have to make these a priority in all new cities I visit! Not only are you able to try some delicious food, but you also get to explore neighborhoods you might not visit otherwise and learn a lot about the history of the neighborhoods as well as the city. This tour, led by Best Tours, started at the Chelsea Market and took us through the West Village, Greenwich Village and SoHo. Such great neighborhoods and deliciously yummy food! We sampled chocolates from Li-Lac Chocolates, mini chocolate cupcakes from Magnolia Bakery, huge, warm chocolate chip cookies from Milk & Cookies Bakery, unique chocolates from Royce’ Chocolate (popcorn chocolate or potato chip chocolate caramel, anyone? ), chocolate macaron from Bisous Ciao (feeding my insatiable macaron obsession), and more unique chocolates from Vosges Haut-Chocolat. Whew! We were fast on our way to a chocolate overdose and swore we wouldn’t be eating any more sweets during our remaining time in New York (that vow lasted less than 24 hours…). The next day was Sunday and we decided to head to Brooklyn to attend a service at The Brooklyn Tabernacle. Upon arrival, we were shocked to see a line of people wrapped around the block waiting to enter for the next service! I’ve never waited in line for church before! 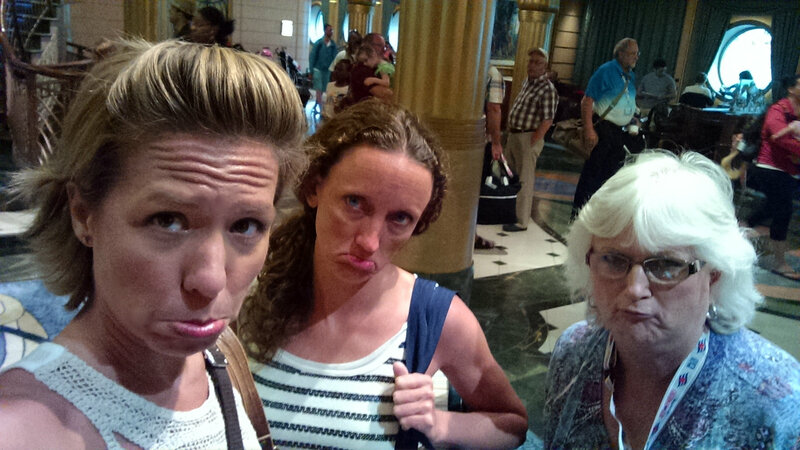 But it was worth it and we thoroughly enjoyed our time there and hearing the famous Brooklyn Tabernacle choir. Since we were here, we decided to spend some more time in Brooklyn. First things first and that was lunch! Teresa remembered reading about a famous pizzeria nearby so we headed toward the Brooklyn Bridge and Juliana’s Pizza. There was a short line outside but we didn’t wait too long and were soon seated inside, devouring one of the most delicious pizzas either of us have ever had. And what better way to return to Manhattan than via the Brooklyn Bridge! We waited until the sun was starting to make its descent then set off for the mile plus trek across this huge, architecturally beautiful link between the two boroughs. The walkway was much more crowded than we were expecting but we still enjoyed the stroll and even more so, the views. Time for more theater! The next morning, after picking up bagels from Best Bagels & Coffee (because what visit to NYC is complete without a good bagel? ), we waited in line at the Westside Theatre for rush tickets to see White Rabbit Red Rabbit. And by “line” I mean the two of us were numbers two and three out of a total of four waiting. 😀 But we snagged front row seats! Between waiting for tickets in the morning and actually going to the show that evening, we embarked on our own little tour of the Upper West Side and more specifically, filming locations used in the movie You’ve Got Mail. That movie has been a favorite of ours for years and we quote lines from it all. the. time. That evening we returned to the Westside Theatre where we sat in seats so close to the small stage, our knees were nearly touching it. This is the most unique play I’ve ever seen. I don’t want to give too much away but it’s a one-man (or woman) show and performed by someone who has never seen the script until it’s handed to them onstage in front of the audience. A different actor plays the role each performance and the evening we attended, we had the delight of seeing Josh Radnor. He did a fantastic job and it was a really, really enjoyable play that included some audience participation (shhh…don’t tell anyone I told you 😉 ). 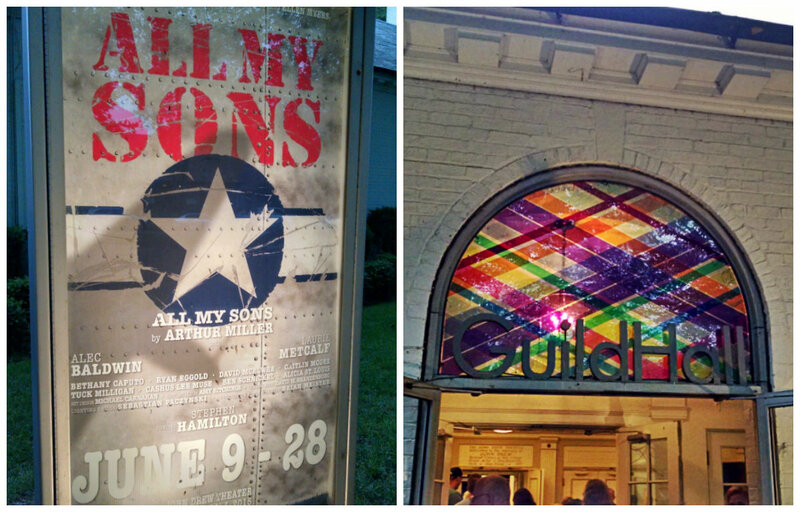 It’s no longer playing in NY but if it ever returns – I highly recommend seeing it! Anyhoo, on to more highlights of my solo time in the province of British Columbia! I’ve highlighted a few things already but still have a few more I want to share. As I searched online for the best things to see, do and eat in Vancouver, I came across what is touted as one of the best places to get gelato: La Casa Gelato. One of their claims to fame is being the only gelateria in the world to offer 238 different flavors of gelato everyday (they have 588+ total flavors). That’s…a lot of gelato. So one afternoon I made my way to this gelateria that was established in 1982. I walked inside and was immediately overwhelmed by all of the different flavors! I decided to take my time and see each and every one, taking notes on my phone of those I might want to try. They have some crazy flavors!! Wasabi, anyone? How about peanut butter curry or wild fennel? Perhaps aged balsamic vinegar or apple cheddar is more up your alley. I sampled pancakes & syrup, lavender, and roasted garlic. Yes, roasted garlic gelato exists. And it tastes like…roasted garlic. With a hint of sweetness. I ended up getting two scoops: Sicilian cannoli and peach, plum, jasmine (sorry, roasted garlic). I took my scoops outside to a little sitting area across the street and sat in the shade. Both were really good but the Sicilian cannoli was my favorite. I will definitely return to try some more flavors the next time I’m in Vancouver! So I’m noticing that probably half of my Vancouver “highlights” have to do with food. This is very typical of me. 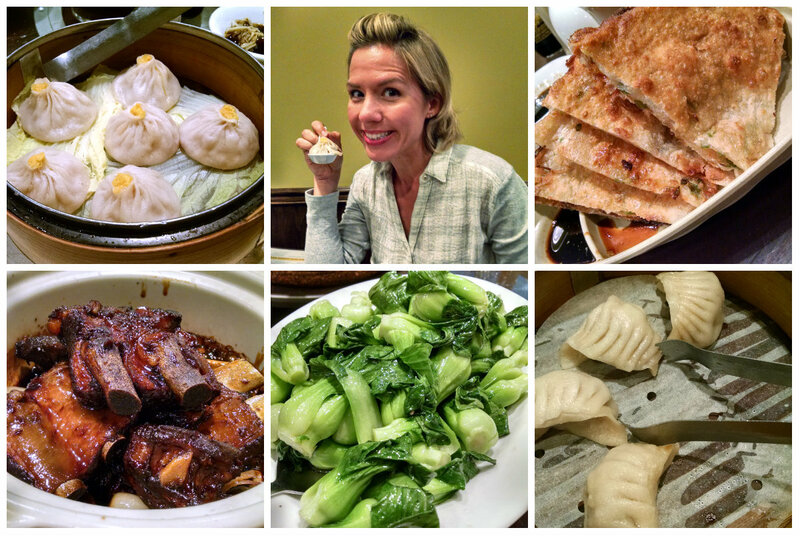 I’ve wanted to take a foodie tour ever since I visited Seattle and first heard about them. I was determined to try one while in Vancouver and decided on a tour of the Granville Island Market. I joined a group through Foodie Tours and it was most deserving of a top place in my highlights! Our group was small, only six of us plus our tour guide, but it was perfect. We met up at Edible Canada then made our way to the indoor market. One thing I loved about this tour, other than the food, was all of the history and information shared that I otherwise would have never known. For instance, only businesses that originated in Canada are allowed on Granville Island. Hence why you won’t see any chain restaurants or stores. The market is open seven days a week and has 50 permanent vendors and 40 pop-up vendors. We started at Terra Breads where we were each given a small brown bag with three different kinds of breads: a crispy, fruity one, a walnut bread and a rosemary sourdough (my favorite). We munched on those while we headed to our next stop: Oyama Sausage Co.
Our tour guide was given a tray of charcuterie and we took it outside and each tried one of the six dried and cured meats (including bison and elk!). Back inside the market we visited Benton Brothers Fine Cheese and sampled a couple of different varieties including a six-year-old cheddar which was very strong but tasty. On to #1 Orchard and some fresh Pink Lady apples! Then a Masala Chai Latte from Granville Island Tea Company. These donuts are SO GOOD!! 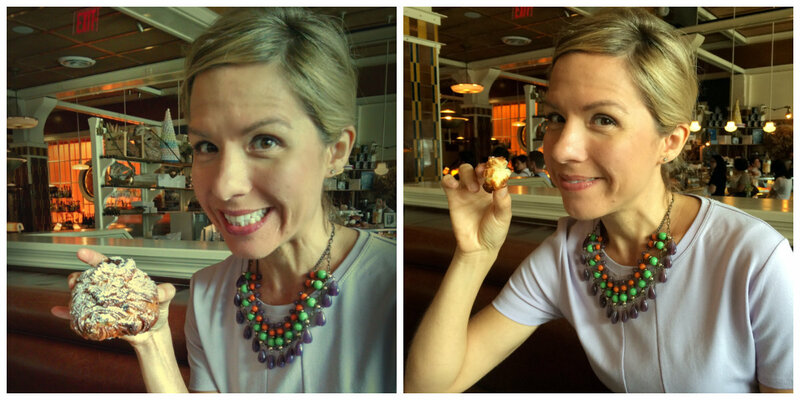 We tried the honey-glazed fresh from the fryer/glazer and it was melt-in-your-mouth sweet goodness. My mouth is watering just thinking about it. I actually came back to Granville Island on my last full day in Vancouver to get another donut. They are the best donuts on the planet. Don’t even try to argue with me on that one. We came full-circle and ended where we started: Edible Canada. This is a restaurant focusing on serving local products, with an adjacent artisan retail shop. We sat outside at a large table and were served the Farmers Harvest Salad with Yukon Arctic Char Gravlax. So. Much. Goodness. Just, yum. Our tour concluded inside the retail shop where we were each given samples of black truffle salt (I do love truffles! ), bourbon infused maple syrup, and almond butter crunch milk chocolate. Such a lovely tour with a very knowledgeable and entertaining tour guide. I was glad we had a small group because we were able to chat and get to know each other. The food was wonderful and I only wish I had been able to go on some more foodie tours while I was in town! I was determined to keep up my running after completing the marathon and I really couldn’t have asked for a better place to be to keep my running motivation up! I absolutely loved running while in Vancouver and was seriously motivated by seeing so many people out running and biking every hour of every day. I would run around Stanley Park or along the shore and beach and it was always so lovely. Take me back!!!!! Last month I started highlighting some of the “adventures” I had on my own in Vancouver this past May. It was turning into a pretty long post so, here is Part 2! 🙂 And this post contains one of the biggest highlights of my time there. So without further ado, I present to you, the Grouse Grind! The Grouse Grind…aka “Mother Nature’s Stairmaster”…aka “The 2nd Hardest Physical Challenge I’ve Ever Completed” (my marathon being the first 🙂 ). The Grouse Grind is something I have wanted to do since my first visit to Vancouver in 2013. It is a 2.9km trail up the face of Grouse Mountain. Key word there is “up”. The Grouse Grind has an elevation gain of 2,800 feet, a total of 2,830 stairs, and takes the average hiker 1.5 hours to complete. Needless to say, it’s quite the workout! I was determined to attempt this climb once I had recovered from the marathon. I spoke to many people in Vancouver who had completed it, read numerous blogs and articles regarding it, but when it came time for me to actually do it, I was so nervous! I made my way toward Grouse Mountain on a clear, crisp Friday morning (much like the weather I wish we were experiencing in Florida now that Fall has arrived…). As I drove closer and closer to my destination, my heart pounded harder and harder and the knots in my stomach grew. I actually think I was more nervous about attempting this hike than I was my first marathon! I think it was the “unknown” factor – I didn’t really know what to expect despite all of the research I had done. One thing I was surprised about were the number of people hiking the trail on a weekday. I was both relieved not to be alone (should I fall, break a bone, have a stroke, pull a muscle, or experience heart failure – all perfectly reasonable possibilities), but also a bit disappointed not to have the trail to myself as it wasn’t quite as serene. Not that climbing 2,830 steps is a serene act…at all. The trail is marked every quarter and I was told and had read that you’ll think you’re nearing the halfway mark when the quarter mark will come into view. So I was super surprised when I did see it – not as far as I had expected! Hard, yes, but not “I’m going to DIE!! !” hard. Yet. Even once I arrived at the halfway mark I still felt pretty good and felt like I was making good time. And then came the 3/4 mark. Which I thought had perhaps been stolen by grizzlies. It was clearly no longer on this trail. I was very confident about this. And when I heard someone above me shout, “We made it!”, I knew I had reached the top! Only to turn a corner and see that elusive 3/4 marker. This was when I started questioning my sanity in wanting to do this hike in the first place. But I wasn’t about to stop now! I finally saw the trail clearing up ahead and knew I had made it! I finished in 1 hour and 12 minutes – much less than the two hours I thought it was going to take me. 😀 Once at the top, I just stood in the sun for a bit, reveling in the fact that I had just accomplished my second crazy difficult challenge in two weeks. This was the toughest hike I have ever done, hands down. It was constant climbing – no level areas at all. But I did it and was so happy and proud! I thought I wouldn’t be able to walk the next day but my legs were fine. Whew!! I can see how people can become addicted to this hike. It is so, so difficult but is such a good workout and you feel such a sense of accomplishment once at the top! I would definitely do it again!!! Stay tuned for more highlights from my time in one of my favorite places in the world! Anyway, I’ve dedicated quite a few posts to Vancouver so I thought I would just highlight a few of my favorite experiences while I was there by myself. There were quite a few “favorites”, however, so this will most likely turn into multiple posts, anyway. Oh well. Okay, so I know most people would not consider Whole Foods to be a highlight of a month spent in Vancouver. But I do. Because this isn’t just any Whole Foods – this is North America’s largest Whole Foods. I work across the street from a Whole Foods in Orlando. It’s one of my favorite places and you can find me there multiple times per week. But when I walked into this Whole Foods in West Vancouver, I’m pretty sure I heard angels singing. The first time I visited I had no idea it carried the distinction of being the largest in North America – I just knew there were some groceries I needed to run in really quick to buy. As I walked in the door, my mouth fell open. I was completely beside myself because I already had other groceries sitting in my car and couldn’t spend three hours exploring all of the aisles. But I returned numerous times and can now add one more thing to the list of reasons I need to live in Vancouver. One thing I loved during my three weeks on my own in Vancouver was the freedom to really do and go wherever I wanted, anytime I wanted. I would read about a place, or someone would recommend a must-see or must-do, and I would just go! I got to explore so many new places I had never been before and I loved it! One of those places was Whytecliff Park in West Vancouver. I packed a picnic lunch and drove here on a Monday afternoon. I had no idea what to do or where to go once I got there so I just parked my car and started wandering. I ended up wandering to a perfect, secluded spot with a picnic table and a gorgeous view. Such a lovely, peaceful lunch! This became my go-to beach. My initial reasoning for this was because parking there is free, but I left absolutely loving this wide, sandy expanse with amazing views of the mountains, the city and the sea. I would come here with a picnic lunch or dinner and a book and spend countless hours laying out (or wrapped up in a towel) reading, napping and taking countless photos of some amazing sunsets. Loved it! 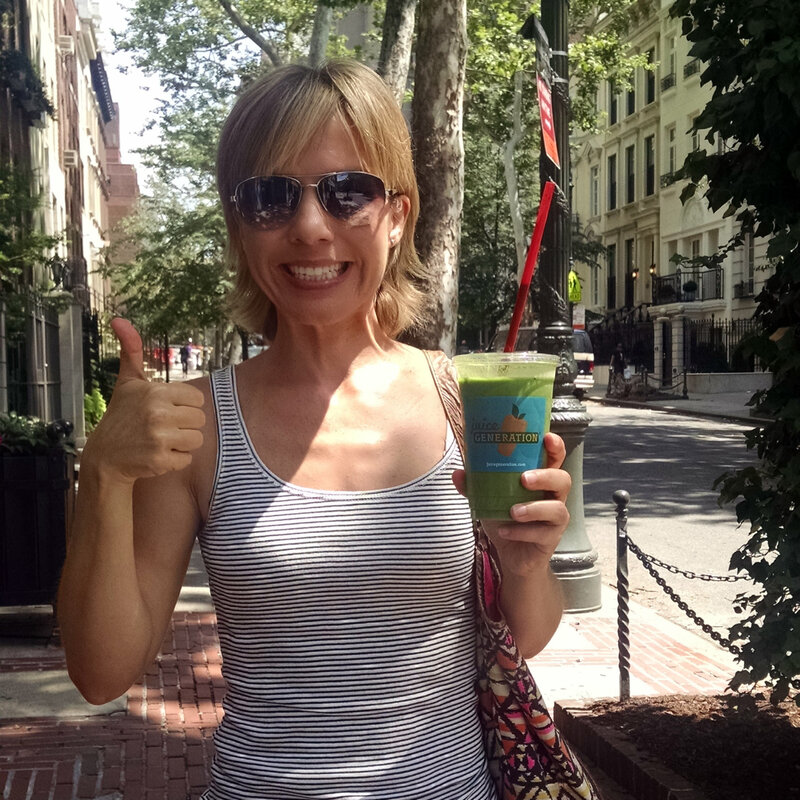 Some of my favorite places to get healthier food in Vancouver were: The Green Moustache, MELU Juice & Health Bar, Tao Organics, Anchor Eatery, BluHouse Cafe, and Heirloom Juice Co. Sooo good and sooo wish we had ALL of these restaurants/cafes in Orlando! Fresh bought French pastries. Book. Beach. Sunset. Need I say more? Another place I intended to return to but never did. I drove here from North Vancouver one Saturday evening, parked my car, and walked through the small village. Horseshoe Bay is home to the BC Ferries terminal but offers very beautiful and peaceful surroundings for pedestrians as well. I picked up fish ‘n’ chips from the takeaway window at Troll’s Restaurant, walked down to the water, and claimed one of the adirondack chairs perfectly situated with a view of the bay, wharf and mountains. It was so, so lovely and I could have sat there for hours! And if I had brought a book with me I probably would have! I really enjoyed the peacefulness I felt there and the beautiful views. I have so many more highlights to “highlight” but think I will save them for another post. 🙂 Stay tuned! So I’m back in Orlando. As I write this, it’s 91ºF in Orlando. It’s 63ºF in Vancouver right now. Any guesses where I’d rather be? 😀 Wishing I were somewhere cooler but very thankful for the time I had to enjoy the beauty that is British Columbia and more specifically, Vancouver. Two days after our marathon, Teresa and I decided to give our legs another challenge. We had heard much of, and could see from town, Quarry Rock, a large, rocky outcrop that overlooks Deep Cove and the Indian Arm inlet and from which you can see for miles. Accessing the rock requires a 3.8km hike through beautiful forests (and up and down numerous steps!). We woke up early to give us enough time to do the hike and get Teresa to the airport in time to make her flight home. I’m so glad she was able to do this before she left! Hiking through the forest in the early morning hours is just so, so wonderful and peaceful. The birds chirping, the fresh scent of pine, the cool breeze, the peacefulness – I loved it! We took our time going up (our still recovering muscles had a lot to do with that 🙂 ) and once we got to the top, we spent some time just sitting on the rock and enjoying the views and the quiet. Quarry Rock, and the trail leading up to it, can get quite crowded but we pretty much had the place to ourselves (bonus to going early in the morning!). Such a perfectly, beautiful start to our day! The hike down was much quicker and Teresa had just enough time to finish packing, get ready and get to the airport for her flight. I was so sad to see her go and so wish she could have spent more time in Vancouver! After my parents and I dropped her off, I thought it would be a perfect time to get some fish ‘n’ chips at the highly recommended, Go Fish, a takeaway seafood shack located on Fisherman’s Wharf across the inlet from Granville Island. This is a popular place at lunchtime and we had to wait in line a good 25-30 minutes to order our food. But it was worth it! My Dad and I had the salmon and my Mom ordered the cod. Each was served with a bucket-full of fries and some yummy coleslaw. We nabbed one of the patio tables and ate as much as we could while enjoying the beautiful weather. The following day was the first overcast, gloomy, rainy day we had experienced in the traditionally overcast, gloomy, rainy city of Vancouver. But we didn’t mind! It made the surroundings and our view even more beautiful somehow, and it gave us permission to rest and take it easy for a day. For dinner, we decided to go out for some good seafood. It took us forever to nail down a place to eat! We ended up going to the Pink Peppercorn Seafood House. This was not my first choice but it was my Dad’s as it had great reviews. I was basing my adverse feelings for it solely on it’s appearance. Or lack thereof. I wanted to go somewhere with great food, but also great ambience. But I gave in and we drove to Pink Peppercorn. This is one of those places you wouldn’t look twice at passing by and most likely wouldn’t go in if you didn’t already know something about it. BUT, it ended up being great!!! So the decor was dated and there weren’t any views. The food, the service and the fantastic playlist (Frank Sinatra, Michael Buble, Tony Bennet) more than made up for it! We all had such a great time together and thoroughly enjoyed our meal. 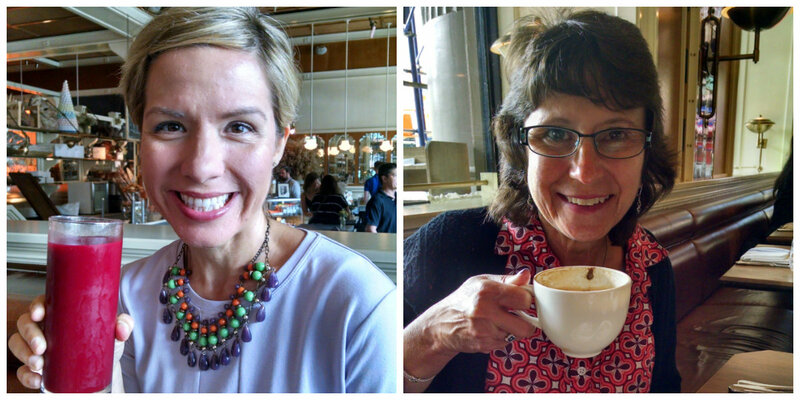 The following day, after breakfast at BluHouse Cafe in Deep Cove (my third time there – loved it! ), we headed back to one of my favorite places in Vancouver: Stanley Park. Although we had taken a horse-drawn carriage tour here at the beginning of our trip, I wanted my parents to enjoy the pastime of walking around the seawall. We parked at Prospect Point and took the steep trail down to the seawall (I had forgotten just how steep and long the trail was until I was traversing it with my parents 😛 ). Unfortunately for us, the sun hadn’t quite reached the side of Stanley Park we were walking along and with the brisk wind and cool temps, we were pretty much shivering the entire walk. But it was still so beautiful and fun and can I please live here so I can walk or run or bike along the seawall everyday??? We walked to Third Beach where we took a break with a concession stand-bought lunch then walked back to Prospect Point via the Merilees Trail. It wasn’t as windy on the trail and the sun was shining and it was just lovely. That evening, we had reservations to dine at The Observatory Restaurant on top of Grouse Mountain. I had read online that if you dine at this restaurant, your lift ticket up the mountain is complimentary ($39.95/person!). I thought that was a deal that couldn’t be beat so we made our dinner plans! I had visited Grouse Mountain on my previous trip to Vancouver and really enjoyed it. We took the nearly empty gondola up to the top and were surprised at how much snow was still on the ground at this elevation! We had arrived early so we could spend some time walking around a bit and the first thing we did was follow the bear paw prints on the sidewalk to the grizzly bear refuge. These bears are huge!!! And so fascinating! We spent quite a bit of time watching them while taking 562 photos and 238 minutes of video…only exaggerating a little. From there we walked around a bit and admired the absolutely gorgeous views. Our dining experience at The Observatory was quite nice. We sat by the window with a birds eye view of the city, the sea, Stanley Park, Vancouver Island, and miles and miles beyond. Our meal was fantastic and I especially loved the little “extra” courses that we were surprised with. The gondola ride back down was packed full of sweaty people who had just completed the Grouse Grind (I might just have been one of those sweaty people a little over a week later… 😉 ). But the views were beyond amazing! It was now time to truly enjoy Vancouver. The marathon behind me, still riding high from making it through, crossing the finish line, accomplishing an incredible goal – time to have some FUN! Not that the marathon wasn’t fun(ish), but it was also something I had been anticipating with some anxiety and trepidation. Now that it was in the past, I felt a bit of a weight lift off of my shoulders and was looking forward even more to being in Vancouver and seeing and doing…everything! Since the Monday after the marathon was Teresa’s last full day in Vancouver, we wanted to pack in as much as we could. The day started with a walk back down to Deep Cove Village for breakfast at Cafe Orso. My Dad continued to feed his chocolate croissant obsession while the rest of us ordered Liege waffles – yum! After breakfast it was on to the Capilano Suspension Bridge Park! This was something we all had on our list of things to do in Vancouver and we had a great time! This is one of the most popular attractions in Vancouver so we wanted to get there early to avoid some of the crowds. There is a lot to do at the park and we spent just under four hours enjoying it. We started our time by taking some fun photos (of course!). After initiating my Mom and Dad into the most excellent pastime of mimicking statues, we headed to the main attraction: the suspension bridge. The Capilano Suspension Bridge was originally built in 1889 and stretches 450 feet across and 230 feet above the Capilano River. In other words, it’s really long! We gingerly made our way onto the bridge and noticed right away that it constantly sways. I wasn’t nervous about walking across but I was nervous about dropping my phone into the river below since I was so unsteady. I kept a death grip on it whenever I took it out to take pictures! After making our way across the bridge we started walking along the treetops. Yep, we walked along the treetops. With the help of some stairs and smaller suspension bridges. 🙂 The Treetops Adventure is a really neat attraction which gives you the feeling of walking from tree to tree above the forest floor. I found it fascinating that the viewing platforms are attached to the huge trees without any nails, bolts or screws penetrating them. They are raised every ten years as the trees grow in circumference. So cool! Once we climbed down from our aerial perches, we walked through the Living Forest. This is a rainforest ecosystem and is just beautiful and so peaceful. We took our time strolling along the raised boardwalk and up and down stairs to various viewing points. At this point we were getting a bit hungry so we decided to take a break for some refueling. We opted to eat in the park and picked up food at Logger’s Grill. After a quick visit to the gift shop, we were ready for the last attraction: the Cliffwalk. This is the newest attraction here and is so unique! A series of narrow, suspended walkways jut out from a granite cliff face above the river and as you walk along them, you almost feel like you’re walking on air. Especially in the spots where the base you’re walking on is made of glass! At this point it had warmed up quite a bit so we called it a day at the Capilano Suspension Bridge Park. Since this was Teresa’s last day here, she got to choose what to do next and she chose Granville Island. Teresa and I had visited Granville Island during our previous trip to Vancouver but had arrived in the evening after the market, shops and a lot of the restaurants had closed. So it was time to go back and experience it during the day! We walked through the market much quicker than the three or four hours I would have liked to have spent there 😉 and went out to the waterfront courtyard to sit and bask in the sun for a few minutes. Did anyone else know that Vancouver has the biggest seagulls? Seriously. A lot of creatures grow quite a bit bigger in Vancouver than in Florida I’ve noticed. But the seagulls are seriously almost colossal in size. After resting for a bit, we left the market and walked around the island, visiting various boutique shops. And, A Bread Affair Bakery where I purchased a fresh, still-warm Marquis loaf which we munched on while exploring. 1) BABY GEESE!!! 2) What adults will do for a photo op (at one point I thought the fire department would have to be called to extract me from this truck…) 3) Salmon candy? Tuna candy?? What disgusting madness is this??? We started making our way back to our car and then drove back to Deep Cove. For dinner we opted to have pizza in town at Pomegranate Grillhouse and Cafe, where we enjoyed three different types of pizza while sitting outside. Love it! That evening was pretty low-key, involving pajamas, a movie and ice cream. 🙂 AND a (what I assume to be) freak thunderstorm! Our tour guide through Stanley Park had told us that Vancouver experiences lightening maybe once every seven years (say what?!?) so as we were sitting there and I kept seeing flashes outside, I assumed it was just the TV reflecting off of the windows. But then I heard rumblings and saw more flashes. It was an actual thunderstorm! 26.2 miles. 26.2 miles. Miles. Not feet. Not yards. Not even kilometers. Miles. Every time I finish running a half marathon, the thought always enters my mind, “Who in their right mind would want to run those 13.1 miles again? ?” Well, clearly, at some point I lost my mind and decided that I should run those 13.1 miles again. But, I have to say, I am SO glad I did! Let me rewind just a bit. As I mentioned before, I’ve been running (off and on) for ten years and have quite a few races under my belt. I wouldn’t necessarily say I love to run but I do love the excitement of running in a race (and the medals…it’s all about the medals, right?). Last year, Walt Disney World announced that it would be hosting the inaugural Star Wars “Dark Side” Half Marathon Weekend in April of this year. I was super excited to hear this as I’ve always wanted to participate in the Star Wars races that take place at Disneyland California. The race weekend included three separate events: a 5k on Friday, a 10k on Saturday and the half marathon on Sunday. So what did I do? Registered for all three! Three races, three days in a row. After I had registered and paid a ridiculous amount of money, it occurred to me that I might need to up my half marathon training just a bit. So naturally (or not so naturally) I decided I should train as if I were running a full marathon so I would be more than ready to conquer three races in a row! I mentioned this training plan to my running buddy, Teresa, and she also agreed it was a good idea (she might deny that now…). Of course, once that was decided, I started thinking, “If I’m already training for a full marathon, shouldn’t I go ahead and run a full marathon?” Sounded reasonable so I started checking out various marathons online. I had always said that if I were (hypothetically) to ever run a full marathon, it would have to be in a great location. No way would I run 26.2 miles through the streets of Orlando. Or anywhere else in Florida. A “destination marathon” was the only way to go for me. Enter: the BMO Vancouver Marathon. I had heard of this race before and had always thought it would be a great one to run. Ever since visiting this city four years ago, I have been itching to return. So I brought up the subject of registering for a full marathon to Teresa. For the first time in my life I actually felt like I could do it. I think it’s just as much a mental challenge as a physical one and I was mentally ready (although not yet physically ready). Teresa was game! (With absolutely NO pressure from me…ahem, not much pressure…some pressure) So we started our full marathon training last fall! Teresa and I arrived, along with my parents who came to cheer us on (and visit Canada for the first time), exactly two weeks ago today. We stayed in Deep Cove, a community in North Vancouver, which we all loved and which I’ll write more about in a later post. Picking up our race packets, bibs and shirts at the Health, Sports & Lifestyle Expo! We woke up bright and early Sunday morning (not too hard as the sun rises around 5:30am this time of year 😮) and started getting ready for the race. I was actually a bit more nervous than I thought I was going to be. The longest distance we had run leading up to race day was 23 miles and it hadn’t been too bad, but it had also been a few weeks ago so I was afraid my body wasn’t quite ready for that distance (+3 miles) again. My parents drove us to Queen Elizabeth Park, the start of the race, and dropped us off with lots of “good lucks!” “I love you’s!” and “we’re praying for you!”. One of the things we had been a bit worried about leading up to this race was the very real possibility of running it in the rain. I mean, this is the Pacific Northwest and Vancouver does have a Seattle-like climate. So we were really surprised and relieved when the forecast for the day was sunny skies! Actually, one or two clouds would have been welcomed but we weren’t complaining since we got our “no rain” wish! Teresa had been experiencing issues with her IT band ever since our 23-mile run a few weeks earlier and we were both worried about her being able to run this race. But she started out great and we really enjoyed the first few miles! This was probably the least exciting part of the course, mainly due to the fact that it wasn’t very scenic. But we still enjoyed it and thanked God for each kilometer marker we passed. 🙂 And let me just give a shout-out to the amazing spectators – probably the BEST I’ve ever encountered during a race. Vancouver rocks!! Hot fire fighters ahead? All lies. But Barney the Dinosaur sporting a Shaquille O’Neal cape? Legit. At about mile 7, Teresa’s knee/IT band started acting up and she wasn’t able to run as much. I stuck with her until around mile 9 or 10 when she insisted I run my race and she would run her race. SO hard to do!! It would be one thing if one of us were a faster runner than the other but we’re pretty much both at the same fitness level. But to run ahead of her because of an injury, knowing how badly she wanted to run, was ridiculously hard. I just kept thinking that if our roles were reversed, I would have insisted that she run her race as well. But it was still super hard. I met up with my parents around the halfway mark so they could replenish my energy gel supply. It was great seeing them in the middle of the race! I told them that Teresa would be coming along shortly and that she was in a lot of pain and probably wouldn’t be able to finish the race. Boy did I underestimate her determination!!! She is, seriously, a rockstar. I can’t think of many people who would have continued on when they were in so much pain they couldn’t run. I know I probably wouldn’t have! From about mile 10 on, the scenery became so, so beautiful! The sea, the snow-capped mountains beyond, I just couldn’t take enough of it in. We ran through the UBC campus which was also beautiful, then along the Spanish Banks Beach, through Kitsilano, across the Burrard Bridge, then around Stanley Park along the sea wall. Incredible beauty all around! Okay, they didn’t lie – Teresa did find a fire fighter. But just one. One of the things that got me through was my parents. They are so amazing and they spent the entire race driving around to different locations to see me and Teresa and encourage and cheer us on. After the halfway point, each time I saw them I started to cry. I think it was partly due to the fact that I wasn’t expecting to see them again until the finish line. And they just kept popping up and showing their love and support for me. They are the best. I have the best parents (sorry, I do). Like I said, this race was much more challenging than I thought it was going to be. The last few miles felt like they would never end. But I knew I was going to do this – I was going to cross that finish line with a smile on my face! Since we had driven most of the course the day before, I knew when I was getting close and it spurred me on to finish strong(ish)! Turning that last corner and seeing the finish line 800 meters ahead was a moment I will never forget. The streets lined with people cheering and shouting the most encouraging and supportive words, knowing that I had accomplished my goal, I started crying again. Crossing that finish line was oh so sweet! I don’t think I’ve ever been prouder of an accomplishment before! And then I saw my parents again on the other side of the fence and started sobbing…again. I was so, so happy and still in disbelief that I had done it!!! My legs were shot, I wouldn’t be able to walk normally for a couple of days but, I had done it!!! I spent the next 45 minutes or so walking around, stretching, hydrating and watching the finish line for a glimpse of Teresa. I refused to leave the runners area until she crossed. Finally, I saw her running up with a smile on her face and I started sobbing again and ran toward her to give her a hug. I was so, so, so, so, SO proud of her!!!!! I couldn’t believe she had actually done it! This day was one I won’t soon forget. I accomplished something I never thought I was capable of doing. I don’t think a smile left my face the rest of the day – I was so proud! Of myself, of Teresa, of all that we had BOTH accomplished, physically and mentally. 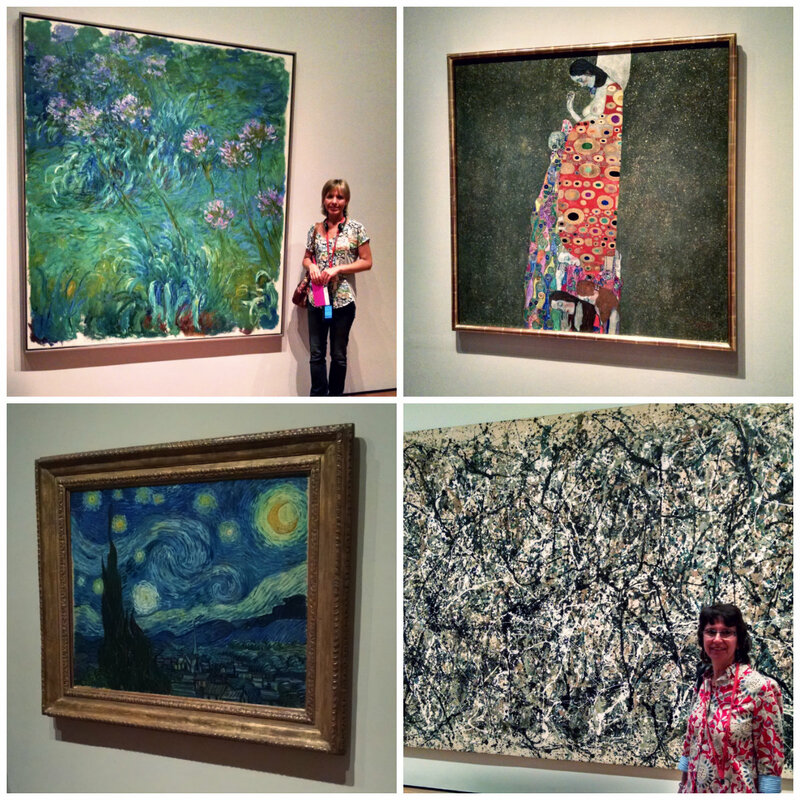 My Aunt Georgann and I started our 4th of July this year by visiting NYC’s Museum of Modern Art. I feel the need to pause for a second and warn any diehard art lovers (more specifically, modern art lovers) to skip the next few paragraphs. 🙂 This is the first modern art museum I’ve visited since I was in Paris in 2007 but my views of it haven’t really changed all that much. Still not much of a fan. At least of quite a bit of it. Case in point: an apple. Sitting on a pedestal. With a security guard watching over it. Yes, I know, we are to appreciate the evolving life cycle of this beloved fruit as it turns from green to brown, from plump to shriveled. Maybe this represents a parallel between our own lives, and is designed to create thoughtful conversation or at least contemplation. Much of the art that wasn’t to my personal taste I could still appreciate as something creative and artistic. But a lot of exhibits were really just beyond me. Or maybe I’m beyond them? All of this is not to say I didn’t enjoy many of the paintings and sculptures and even the design of the museum itself. The floor containing art from the 1880’s – 1940’s I could definitely get behind. I love seeing famous, recognizable paintings up close and personal. Anyway, we had picked up audio guides on our way in and they really helped enhance our visit, sharing more about many of the pieces we saw. We started our visit off slowly, taking our time walking through the rooms and listening to the audio descriptions, but rushed through the last few floors as 1) they contained the more “modern” of the modern art, and 2) for some reason this museum was absolutely freezing!! Neither of us could warm up the entire time we were there! As it was after 2:00 at this point, we were both pretty hungry and ready for lunch. We walked to a little hole-in-the-wall pizza joint a friend of mine had recommended called Bella Vita. Such good pizza!! We each ordered a slice which was heated up to perfection for us. 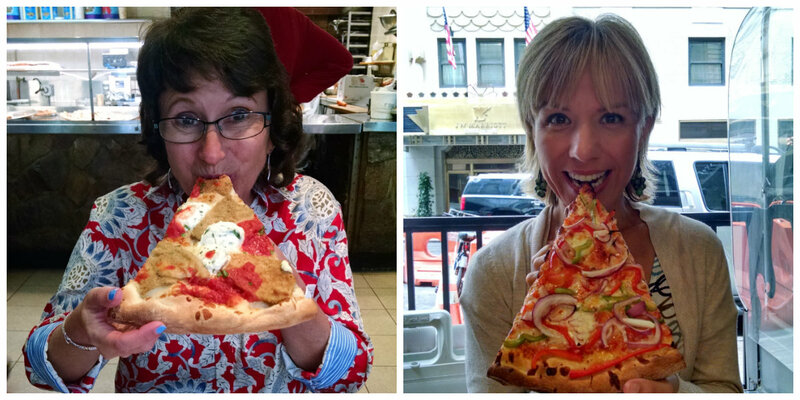 We enjoyed it so much that we each ordered another slice. Yum. 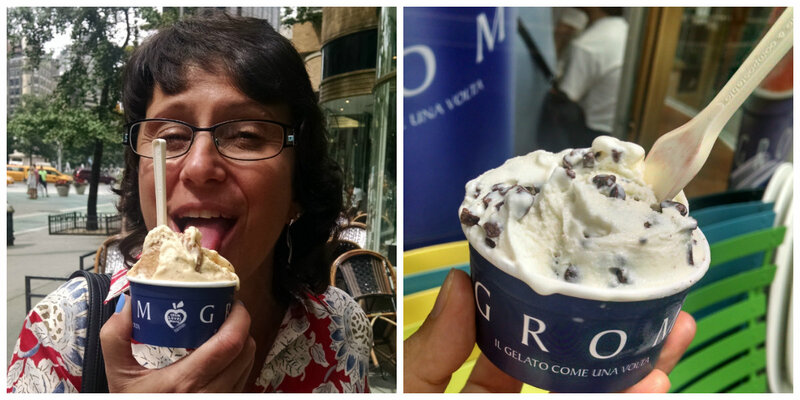 Apparently on a bit of an Italian kick, we then walked a few blocks to Grom for some gelato. Yum again. Stracciatella for me (my favorite gelato flavor) and Crema di Grom for Georgann (egg cream with corn biscuits Colombian “Teyuna” chocolate chips). 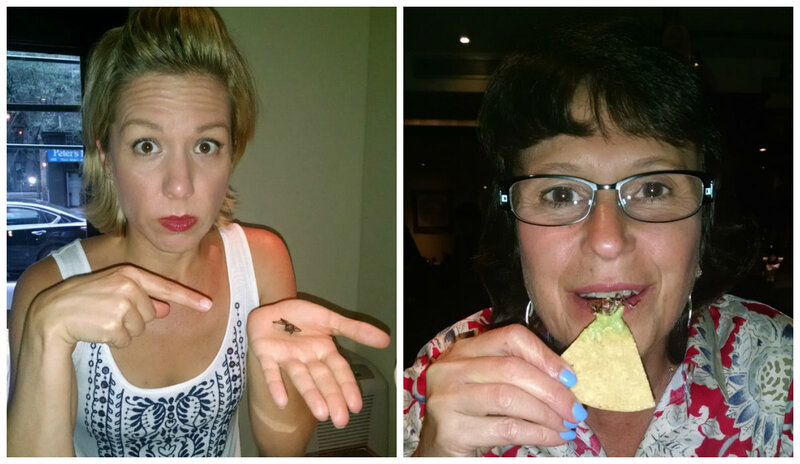 For dinner that evening, we decided to forego the traditional 4th of July hot dogs and go for Mexican instead. 😀 Maya is a “Modern Mexican Kitchen and Tequileria” which was located just around the corner from the apartment we stayed at. What a great place! We ended up sitting in the bar area to take advantage of the happy hour tapas prices. And although we weren’t planning on it, we ended up only ordering tapas because they all sounded so good! 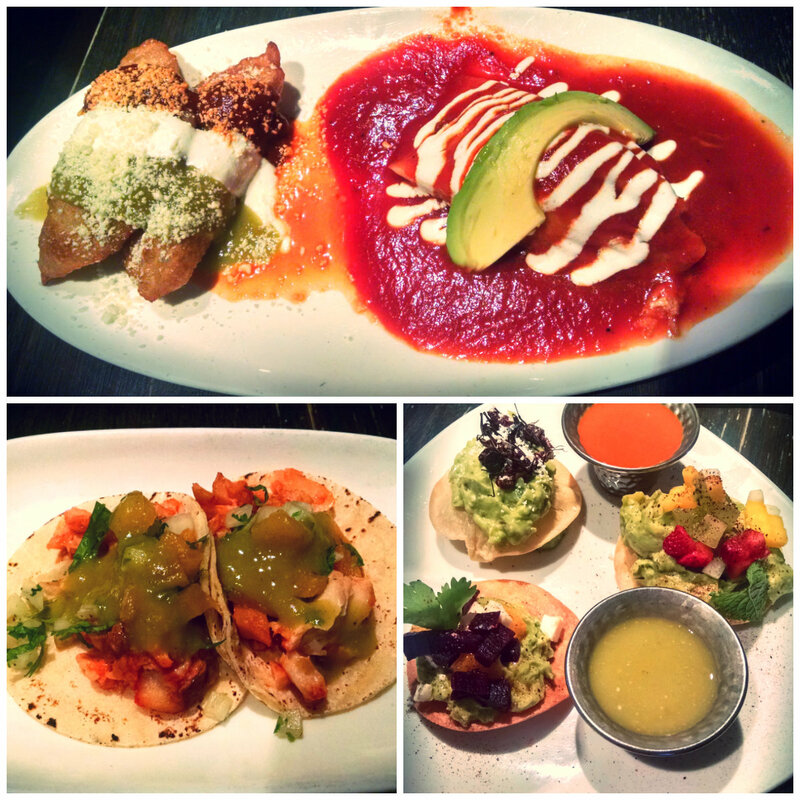 Fish tacos, zucchini flower & poblano chili quesadilla, chicken tamal, skirt steak flatbread, shredded smoked chicken nachos, guacamole sampler…lots of deliciousness going on right there! The guacamole sampler was comprised of three different guacamoles, each inspired by a different region in Mexico: Baja, Sur and Pacifico. 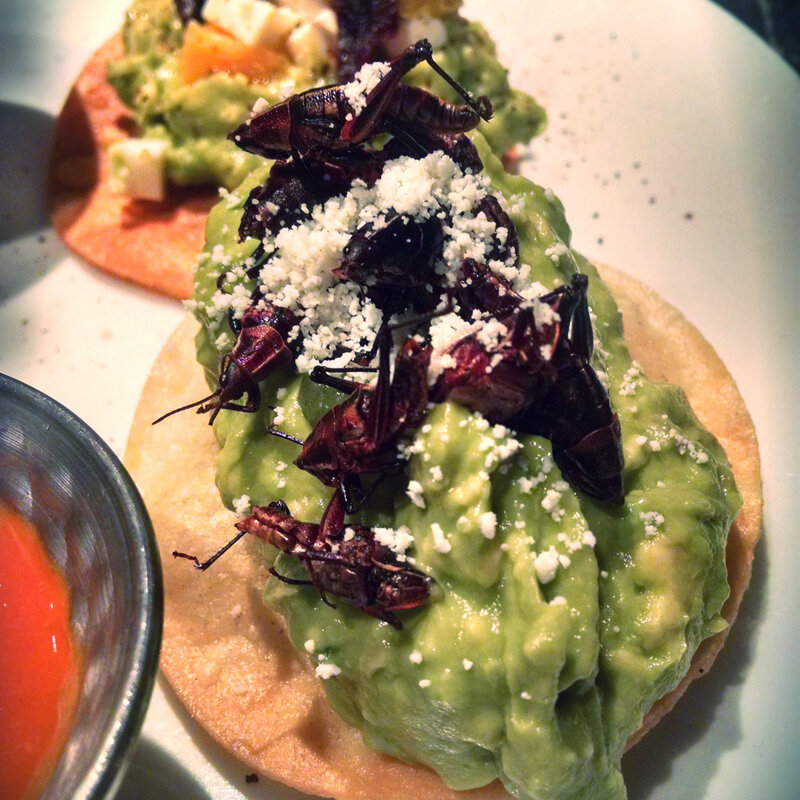 And although we had been warned in advance, we were both still quite shocked when this plate was brought out to us and the lovely Sur guacamole was topped with…grasshoppers. Lots of large grasshoppers. I wasn’t expecting them to be quite so big…or for there to be quite so many. But, we each tried some. Okay, two. We each tried two. That was all we could mentally handle. Leaving the majority of the poor critters behind on our plate, we left the restaurant and started making our way south and to the East River, hoping to find a great viewing location for fireworks. 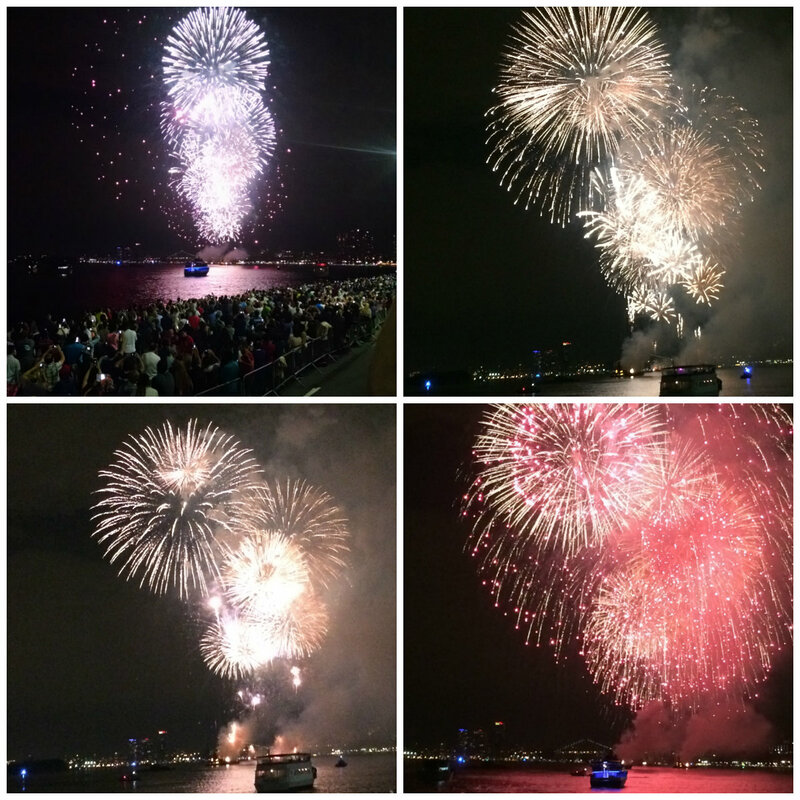 The Macy’s 4th of July Fireworks are touted to be pretty spectacular. Because of this, they draw quite the crowds on this national holiday! We were initially uncertain as to whether we even wanted to fight the craziness to see them but eventually decided to just go for it. The fireworks started not-so-promptly after 9:20 and lasted about 25 minutes. And they were pretty spectacular!! I’m so glad we decided to venture out to watch them! Such a great way to bring our trip to New York to a close! And the pièce de résistance, one of the most glorious pastries I’ve ever had: a banana, chocolate, coconut croissant. 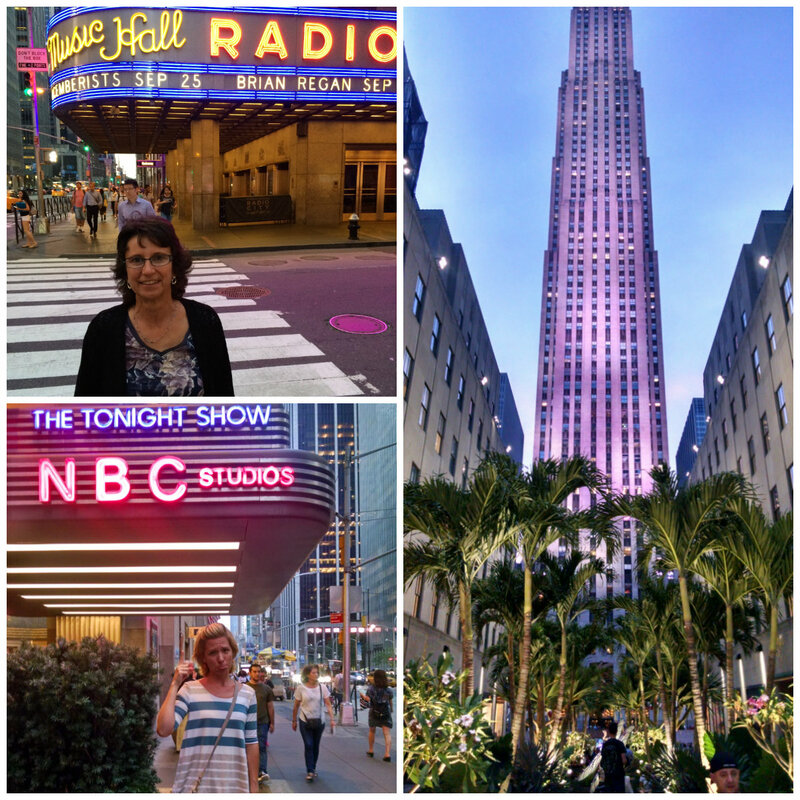 The one thing I had put at the top of my list of things to do during my trip to New York last month (well, the only thing really…other than eat some great food 🙂 ), was to see a Broadway show. More specifically, a Broadway musical. 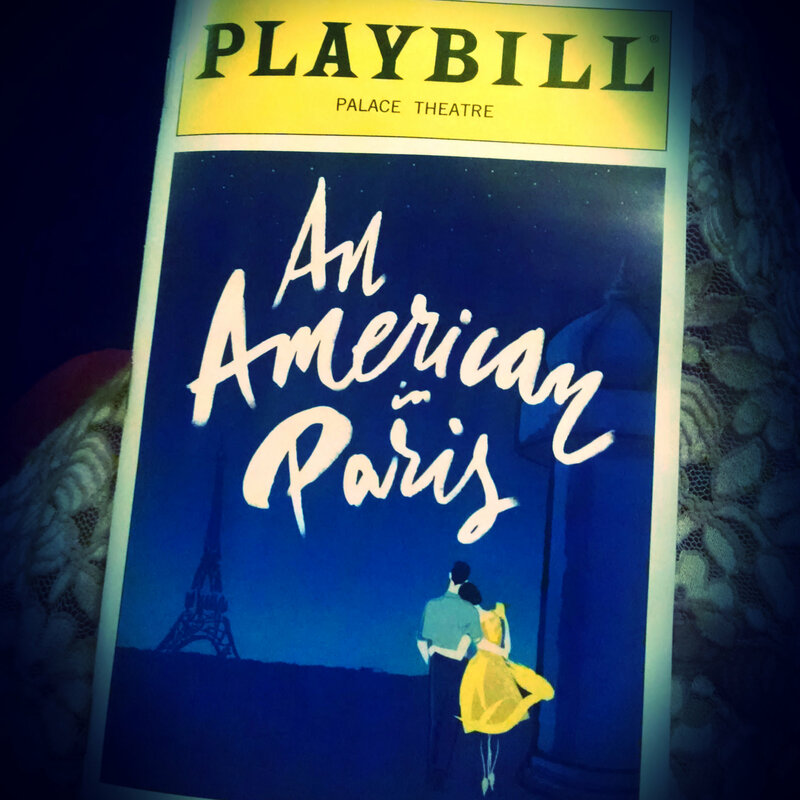 Even more specifically, An American in Paris. After watching the Tony Awards this year I was determined to see this musical during my time in New York. I was a little worried that my Aunt Georgann wouldn’t be on board as she isn’t a fan of musicals, but not only did she humor me and agree to go, she actually enjoyed it! Our Friday started with some fresh pastries and bread I picked up from Grace’s Marketplace (an awesome market located on the Upper East Side that I wish I had discovered earlier!) 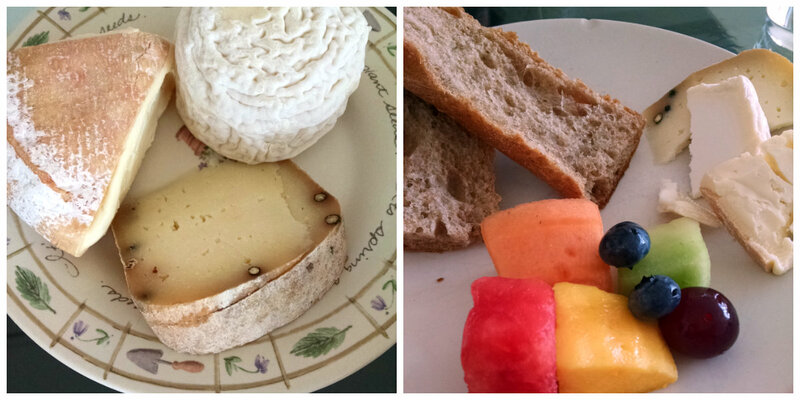 along with some fruit and cheese we had purchased at Chelsea Market on Tuesday. Lovely, lovely way to start the day (although maybe not the healthiest 😛 ). Visiting another museum was originally on our agenda this day but since it was forecasted to be an absolutely beautiful day, we decided to forego the museum for now and spend some time outdoors. I may have mentioned before my love of green space in cities. Okay, I’m pretty sure I’ve brought it up one or two times. Or one or two dozen times. Or more. I just love being outdoors and love cities that have extensive places where one can get away from the hustle and bustle and enjoy some peace in nature. 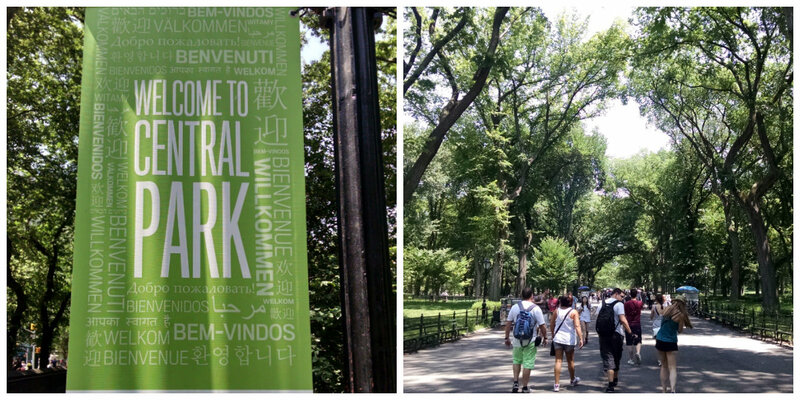 Enter: Central Park. Although it’s still kind of hard to completely “get away” from the NYC craziness while remaining in the city, Central Park does a mighty fine job of providing a pretty extensive oasis. 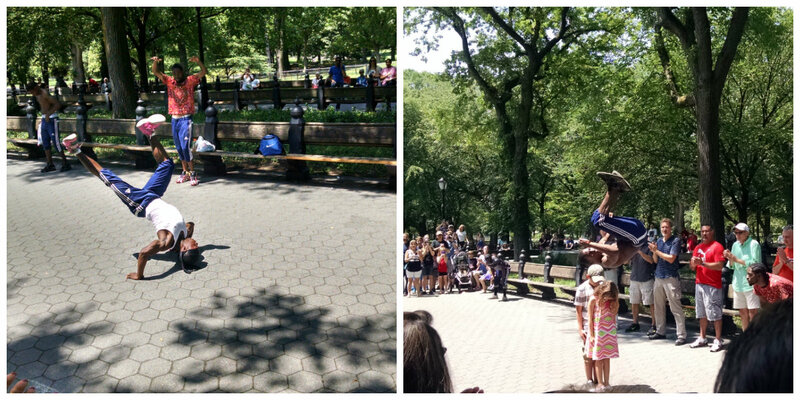 We entered the park from the Upper East Side and strolled along the Mall, stopping near the Naumburg Bandshell to check out some street performers who were stretching and preparing for their act. I don’t remember the name of these guys but they were pretty amazing. Very funny and entertaining and performed some crazy tricks! And yes, the guy on the right is flipping OVER some kids! We stayed for their entire performance then continued our walk and stopped again at Bethesda Fountain to sit for a bit and take some photos. A quick loop around the Boathouse Restaurant and then we found a bench in the shade to sit and people watch while enjoying the beautiful weather. After awhile we decided to head back to our apartment for our daily afternoon “rest”. 🙂 We took a different route back through the park which brought us out at one of the south exits – across the street from The Plaza Hotel. Georgann had never been to The Plaza so we took a quick peek inside then continued to our apartment, stopping along the way at Juice Generation (loved this place! can I try one of everything??) so I could get a green smoothie. Yummm!! 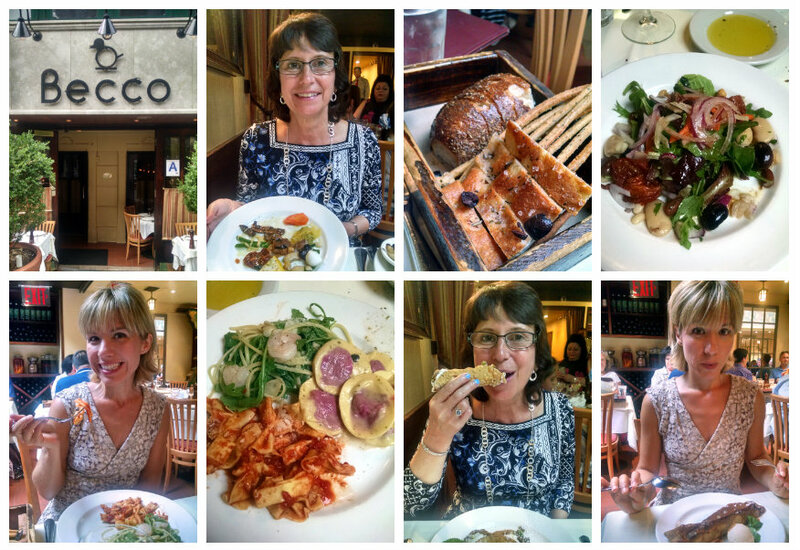 That evening began with an Über ride (I’ve become quite the fan) to Becco – an Italian restaurant opened by chef, author and restauranteur, Lidia Bastianich and her son. This restaurant had been recommended to us and it did not disappoint! The service was impeccable, the food was amazingly delicious, it was a wonderful dining experience! The bread, olives and white bean dip we were presented with shortly after we sat down, the Insalata Mista (I’ll take a bucketful more, please!) and Antipasto Misto (the loveliest antipasto plate either of us had ever seen), and the Sifonia di Paste (unlimited table-side service of three daily pasta preparations) were all so, so good. I had apple strudel with house made cinnamon gelato and Georgann ordered cannoli. Both servings were huge!!! But we still somehow managed to pretty much finish them off. We. Are. Rockstars. Of course the Palace Theater, where An American in Paris is being performed, is right in the middle of Times Square. Oh well. We walked around taking pictures (Georgann trying to master the art of The Selfie…) until the doors opened thirty minutes before the start of the show. New York City is seriously one of those places you could never run out of things to see, do and eat. Which makes it kind of challenging when you only have a few days to see, do and eat EVERYTHING!! Just kidding. 🙂 But not really. But on to what we actually did get to see, do and eat! 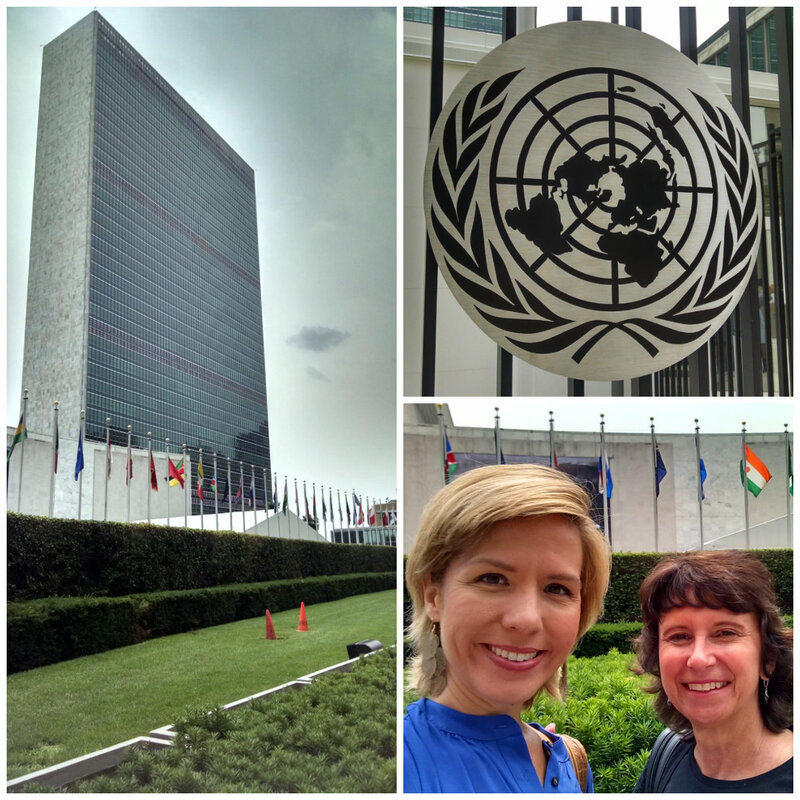 On our fourth full day in Manhattan, we woke up early to get ready and walk to the United Nations Headquarters for a tour. This was something Georgann really wanted to do as her aunt worked for the United Nations in New York for 35 years and was actually a part of its inception! After waiting in a line outside the gates for quite a while, we finally made it inside and through security. We then entered the General Assembly building where our tour commenced. 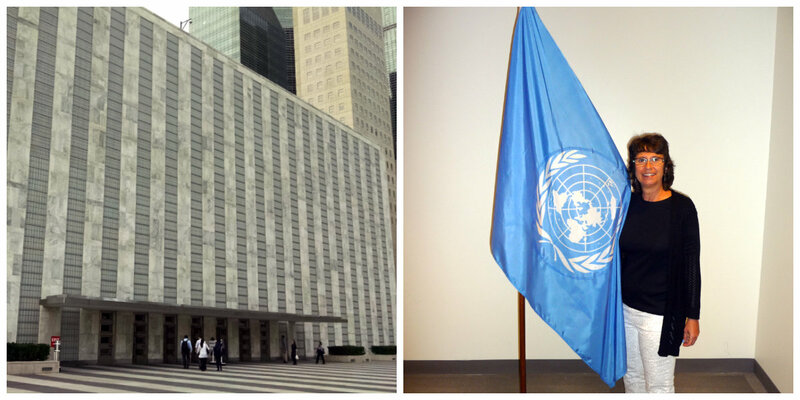 Did you know that the grounds of the UN headquarters are considered international territory? I had no idea! It has its own fire fighting and security forces and even its own post office branch. I actually really enjoyed the tour we took and learning more about the functions and purpose of the United Nations, as well as seeing where issues are brought to the table and solutions are presented. The UN is comprised of 193 sovereign states who, with the help of various specialized agencies, programs, committees, etc., promote and coordinate efforts for peace and friendship among nations as well as support economic and social progress. 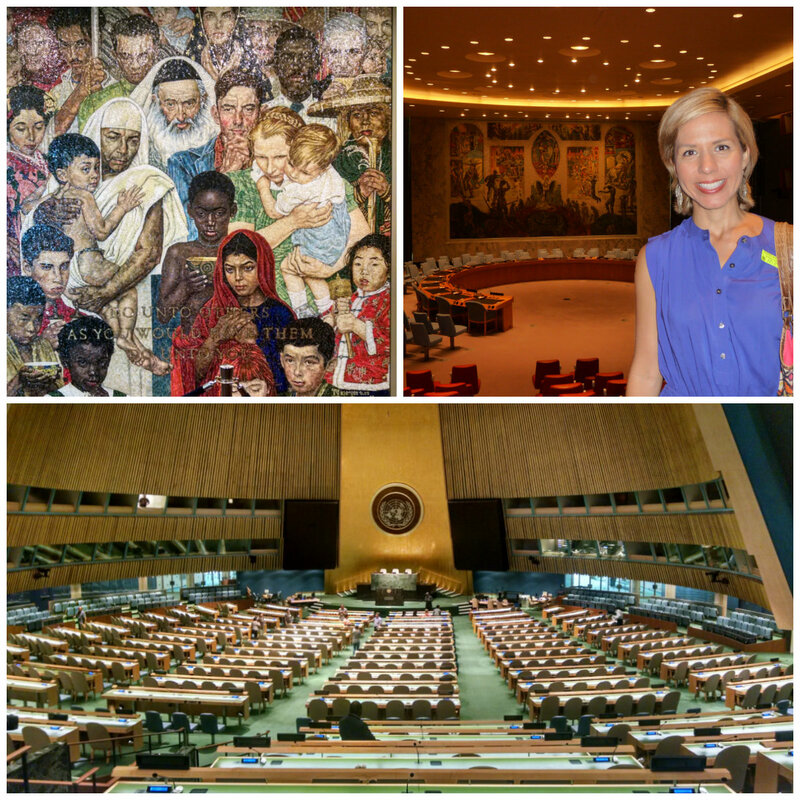 Our tour took us through many different areas and chambers including the Security Council Chamber, the Economic and Social Council Chamber, the Trusteeship Council Chamber and the General Assembly Hall. Two of these chambers had meetings in session so we had to walk through the back of these rooms quickly and were not allowed to take pictures. There are eight goals that encompass everything from reducing child mortality to combatting HIV/AIDS, malaria and other diseases. 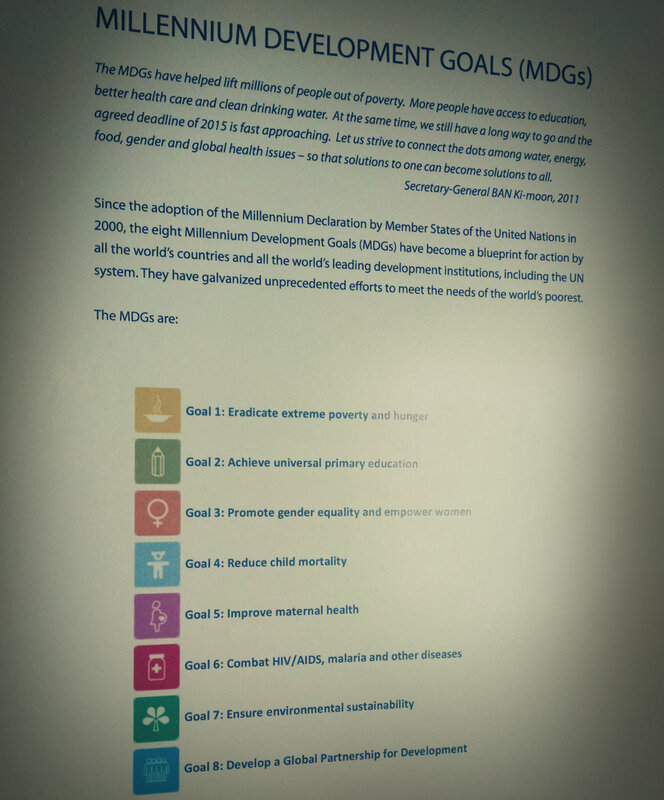 The goal that touched me the most, however, was the first on the list: Eradicate extreme poverty and hunger. Whenever I hear about the suffering of people around the world, especially children, I can hardly stand it. I want to do something about it! There are millions of children alone who are living below the poverty line and are extremely malnourished. It’s just crazy to think that there are humans in this world who are literally dying from hunger. The United Nations World Food Programme has really helped with this but there is just so much more to be done. It’s such an overwhelmingly huge world-wide crisis! It was around lunchtime at this point so we started looking for a place to eat. 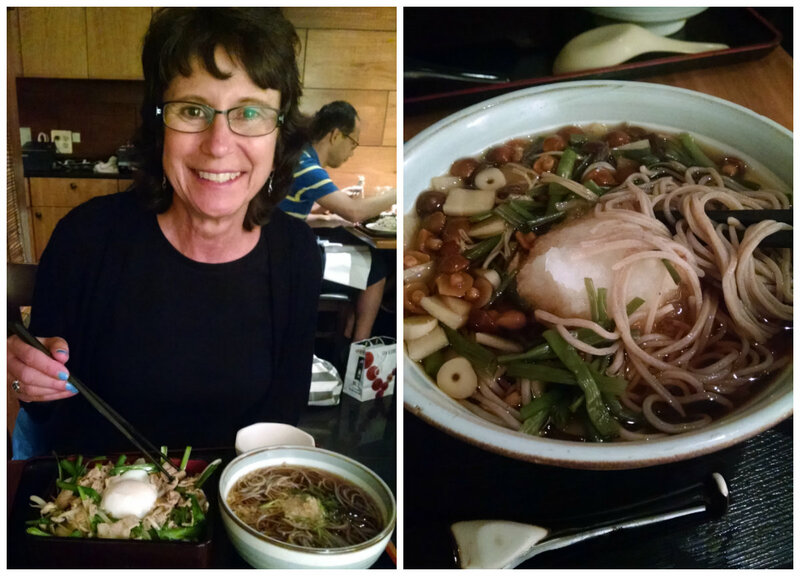 We decided on Soba Totto which had great ratings on Urbanspoon. We had to wait a bit for a table so by the time we sat down we were really looking forward to the soba noodle bowls we were planning on ordering! After lunch we made our way to St. Patrick’s Cathedral. Along the way we passed MacarOn Café which was on my list of “foodie” places to visit. Not to be deterred by the fact that I had just bought and eaten macaroons the day before from Ladurée, I confidently entered this fanciful cafe and drooled over, then purchased, another half dozen delicate cookies. Yum. 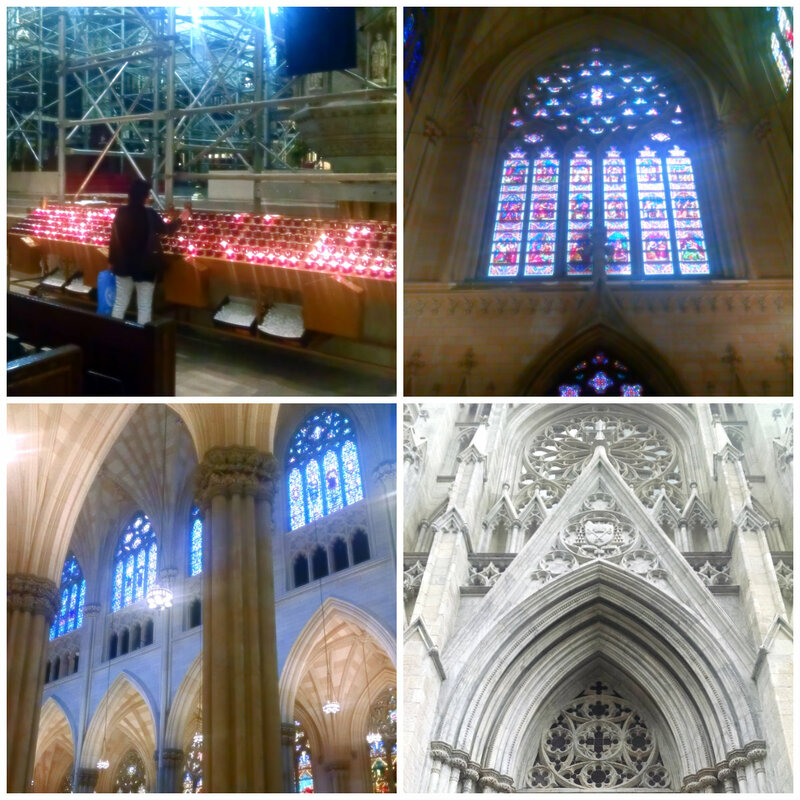 I had visited St. Patrick’s Cathedral on my one and only previous trip to New York years ago, and it was actually the first cathedral I had ever been in. I found it just as impressive now as I did then – even with all of the scaffolding on the inside and outside as they are embarking on a $175 million restoration. This cathedral looks like it was just plucked out of Europe and plopped down in the middle of this metropolitan U.S. city! For dinner this evening, we met a friend of Georgann’s at an Italian restaurant, Coppolas. The food was actually pretty tasty but the service definitely left something to be desired (we dined at the West Side location). 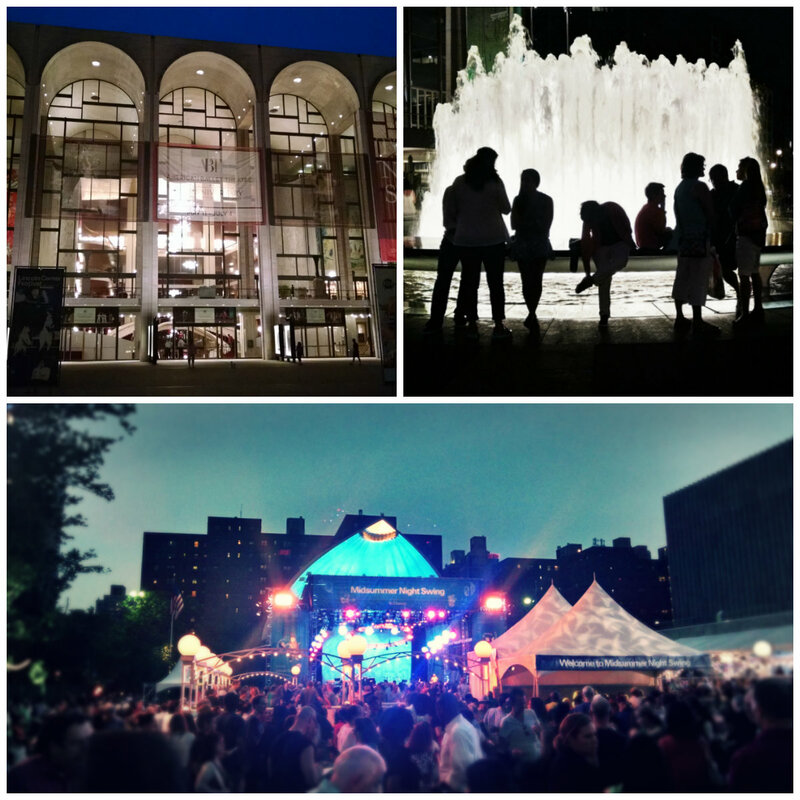 After dinner, Georgann and I made our way to the Lincoln Center area to look around. The American Ballet Theater is (or was) currently performing at the MET – seeing one of those productions at this location is definitely on my bucket list! We were both craving something sweet after our earlier dinner and really wanted some good pastries. Unfortunately all of the nearby bakeries were closed for the evening so we opted for frozen yogurt instead and ate it in Columbus Circle. A lovely way to end another lovely day in the Big Apple! Day two in New York City and my Aunt Georgann and I repacked our suitcases and moved from Queens/Forest Hills to our Airbnb apartment in Manhattan! We also took our first ever ride using Über – a great service we used a few more times during our trip. Our apartment was located in the Upper East Side and was soooo nice! We really lucked out with this one. We “checked in” mid-morning, spent some time unpacking and settling in, then headed back out again. 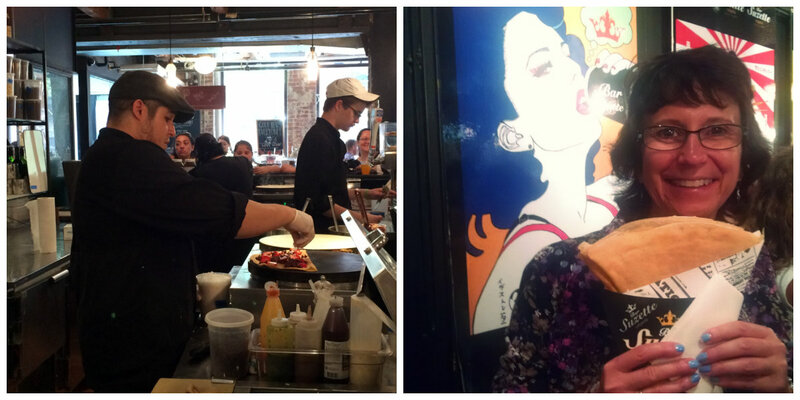 We took the subway to the Meatpacking District and the wonderful Chelsea Market. This market was not at all what I was expecting! I had pictured a typical outdoor market selling the standards: fresh produce, flowers, etc. This is a really nice indoor market that is chock full of some great looking eateries, gourmet food shops, specialty shops and so much more. I absolutely loved it! 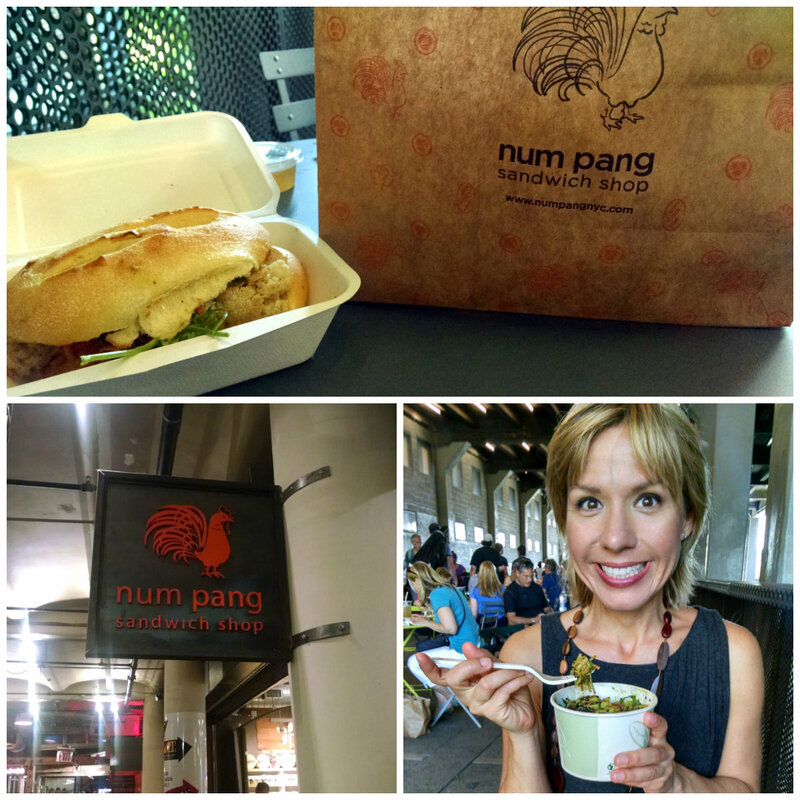 We walked the length of the market checking out the dining options then decided to eat at Num Pang which had been recommended to me by a friend. Great choice! 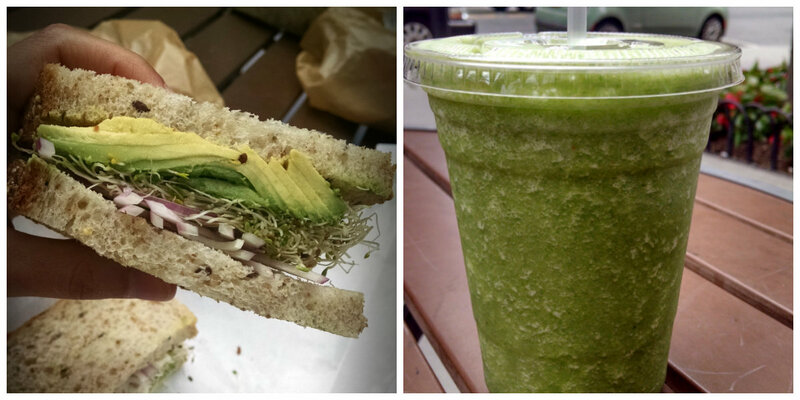 We picked up delicious sandwiches and salads and took them up to the High Line to eat. 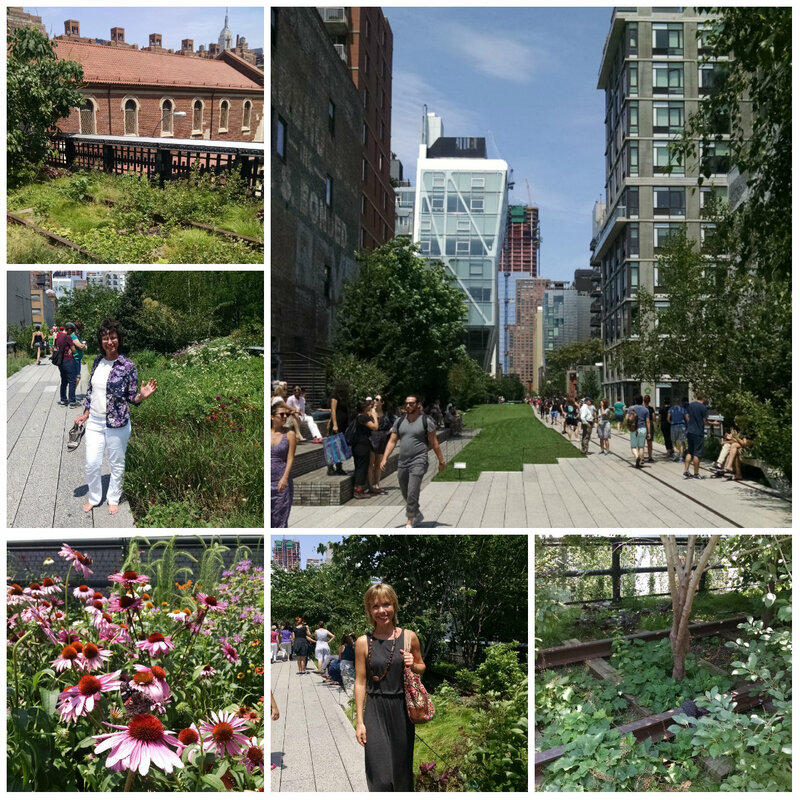 The High Line is a former elevated train track that ran from 34th Street to Spring Street. It was last used in 1980 and is now a nearly 1½ mile-long beautiful public park. 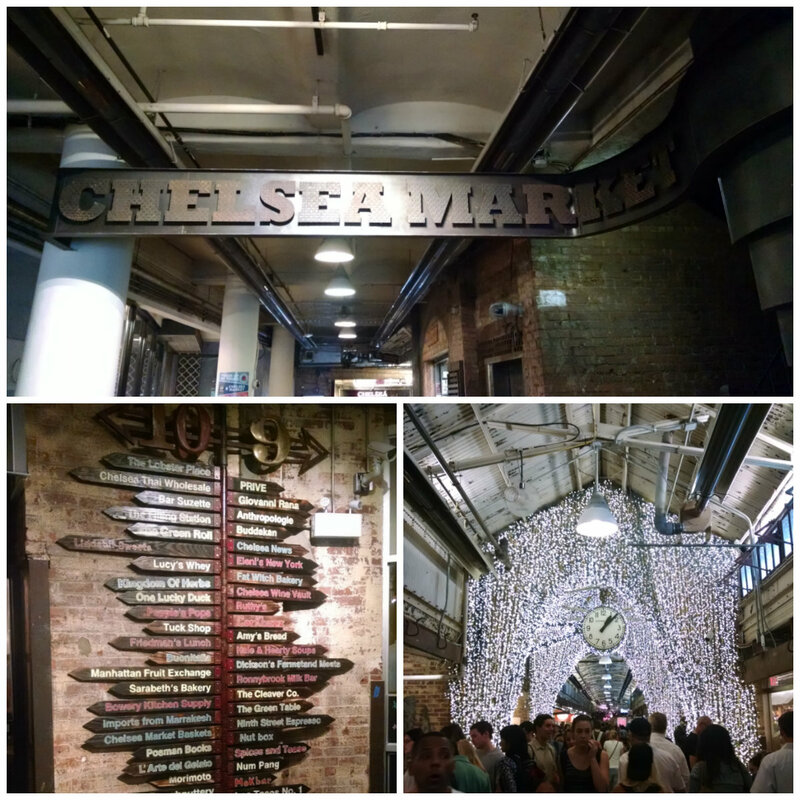 We returned to Chelsea Market to check out some of the shops. I absolutely loved perusing the gourmet/specialty food options! 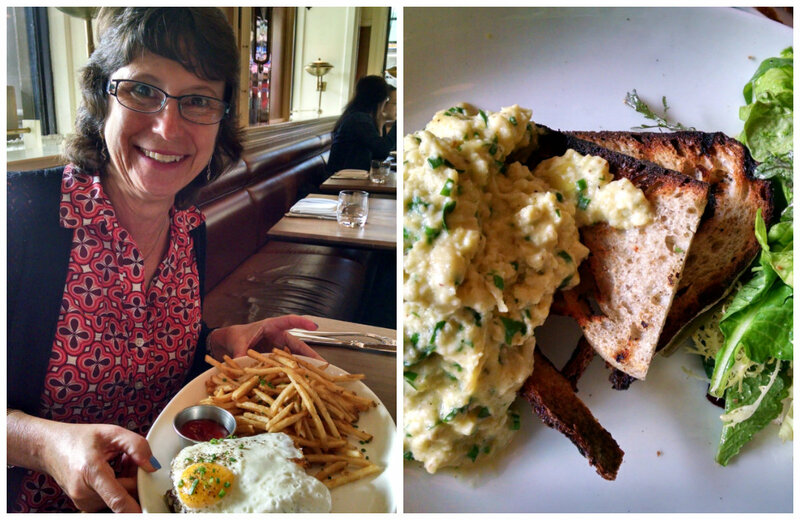 Georgann bought some artisanal cheese at Lucy’s Whey, then we went to Bar Suzette for some crepes. I ordered a honey, almond, banana crepe and Georgann selected a chocolate, coconut, strawberry crepe. We had to wait awhile for them to be made but we enjoyed just sitting at the counter chatting and watching the crepe makers. After awhile we decided we should start figuring out where to eat dinner that evening. Georgann sent a few texts to Maxine’s family and we finally settled on one of their recommendations: Yefsi Estiatorio, a Greek restaurant a few blocks from our apartment. What an excellent choice! We arrived and were told that the wait for a table was 45 minutes, but there were seats available at the bar so we sat there. Another excellent choice! The bartender was great and we were treated so well by him, the restaurant manager and the wait staff. I love these local places that make you feel like family. All of the staff we came in contact with were from Greece and continually spoke Greek to each other (quite passionately I might add 😉 ). We thoroughly enjoyed our dinner here! The following day, Wednesday, was supposed to usher in thunderstorms but we ended up experiencing some lovely weather instead. 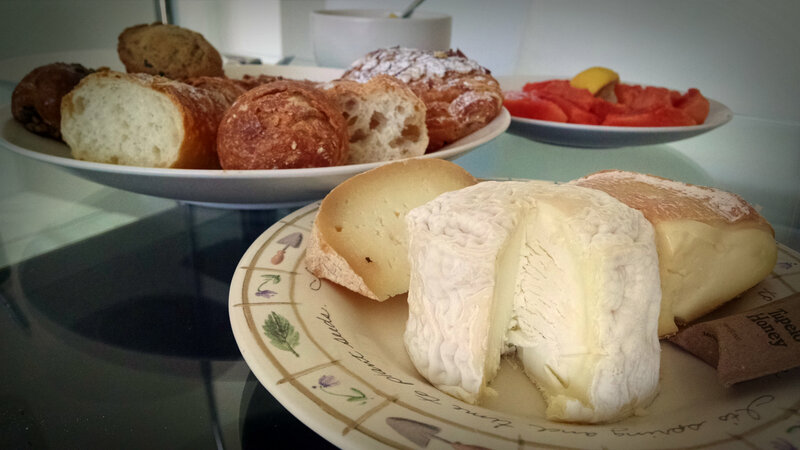 We started our day with a very European breakfast of cheese, baguette and fresh fruit – all purchased the day before at Chelsea Market. Our day out on the town began with a visit to the Frick Collection – an art museum located in the former house (mansion!) of industrialist Henry Clay Frick, an avid art collector who built his home with the intention of turning it into a museum upon his death. He passed away in 1919 and the museum started welcoming visitors in 1935. I really enjoyed visiting this unique museum and seeing not only the exceptional art and furniture but also the incredible architecture in each room – very reminiscent of places I’ve visited in Europe. We picked up audio guides as we entered and listened to them as we walked from room to room. As we left the Frick, my stomach was most insistent that we find some lunch sooner rather than later. 🙂 We decided to just pick something up at a local grocery store to take back to our apartment, but made another quick stop along the way: Laderée on Madison Ave., otherwise known as macaroon heaven. We had intended on purchasing just one each but of course I walked out with half a dozen colorful cookies. Of course. I couldn’t even wait to get back to the apartment before devouring one. So, so yummy. We ate lunch at the apartment, each enjoyed our new afternoon pastimes, 🙂 then got ready to head out for another evening on the town. This evening brought us to Westville in SoHo, another restaurant recommendation which I absolutely loved! Totally my kind of place – great atmosphere with a great, veggie-heavy menu. In fact, I ordered the Market Plate which included a selection of four of their 20+ Market Sides. These aren’t your typical side dishes, however. I had Brussels Sprouts with Honey Dijon, Snow Peas with Sesame and Ginger, Asian Kale Salad, and Fennel with Parmesan. All of it was delicious!!!! And the servings were huge – I couldn’t finish all that was on my plate! Loved this place! After dinner we took the subway to the Rockefeller Center area. Neither of us had ever been there before so we were planning on getting some dessert and enjoying the atmosphere. By the time we arrived, there weren’t a whole lot of “dessert” places still open other than Magnolia Bakery – which was perfect as this bakery had also been recommended to us by a local! Magnolia Bakery has a few locations in Manhattan and this one was just around the corner from the rink at Rockefeller Center. They are known for their banana pudding so Georgann and I had decided in advance that this was what we were going to order. That is until we arrived and were told they were all out of pudding. 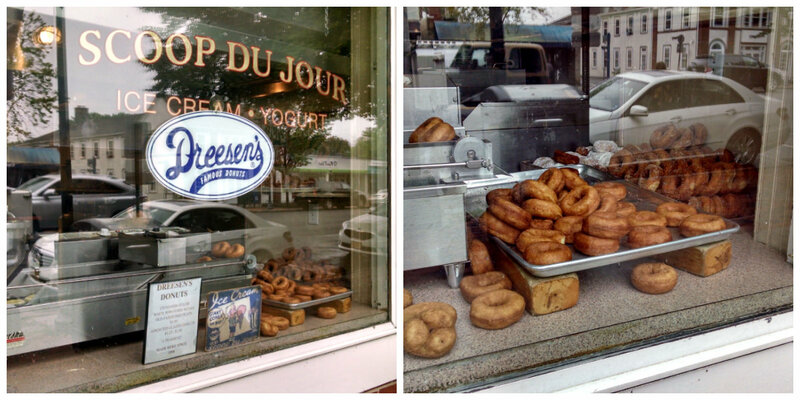 And most of their other bakery items – cupcakes, cookies, tarts – were nearly completely wiped out. I guess that’s what we get for arriving less than an hour before they closed! Determined not to leave without something, I got in line to order. Once I made it to the front of the line, I asked again, just to confirm, if they were out of banana pudding. Yes, they were. BUT, they were expecting a fresh batch to come out any minute! Score!! So we each left with a small (HUGE!) 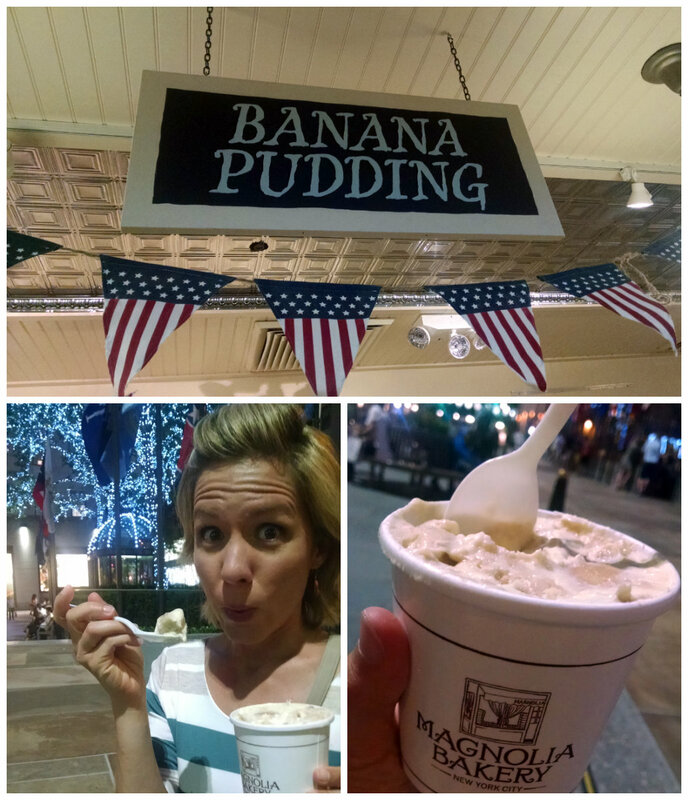 container of some pretty darn good banana pudding. 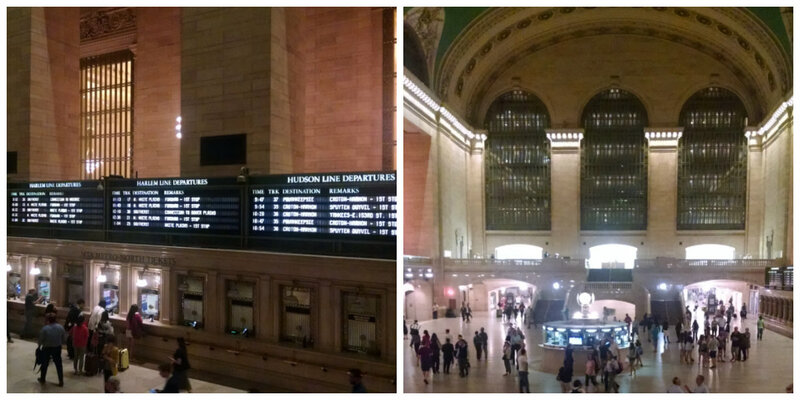 Since we were already out and about and somewhat near it, we decided to walk to Grand Central Station. It took some time before we actually found it but I’m really glad I got to go in and see this famous and historic train terminal. It really is beautiful and massive. We took the subway from there back to our apartment and called it a night. Another long, fun day in NYC!! New York City. There’s no place like it. Love it or hate it, this city will leave an impression on all who visit. For me, after my second trip here, I feel the same as I did after my first (over fifteen years ago! ): I love the excitement, the entertainment and the diversity this city provides. I love visiting… but I don’t think I would love living here. 🙂 I need my space; I need peace and nature; I need occasional silence. Just because I can’t picture myself living here, though, doesn’t mean I’m not already looking forward to my next visit. After spending a relaxing weekend in the Hamptons, my Aunt Georgann and I started the second part of our trip, which began with spending a couple of nights in Forrest Hills with Maxine. On Monday, we were dropped off in Manhattan and immediately made a bee-line for the subway to purchase passes then make our way toward the 9/11 Memorial. I really wasn’t expecting this memorial to be so overwhelmingly moving. I hadn’t read up on it prior to arriving so had no idea what it was going to be like until we were there. Haunting…chilling…yet also a beautiful tribute to honor and remember those who lost their lives on that fateful day. I personally believe the design of this memorial couldn’t be more perfect: two large, square basins, water running down the inside walls into what appears to be a bottomless abyss in the center, the names of those lost etched on the wall surrounding it. The basins stand where each of the twin towers once stood. I had chills as I stood there, knowing what once towered over the surrounding buildings, knowing how many people died on that very spot. I can’t even imagine what that day was like for those who lived through it. There is a 9/11 Museum located onsite but we had heard that reservations are required for a specific entry time so we decided to forego it. 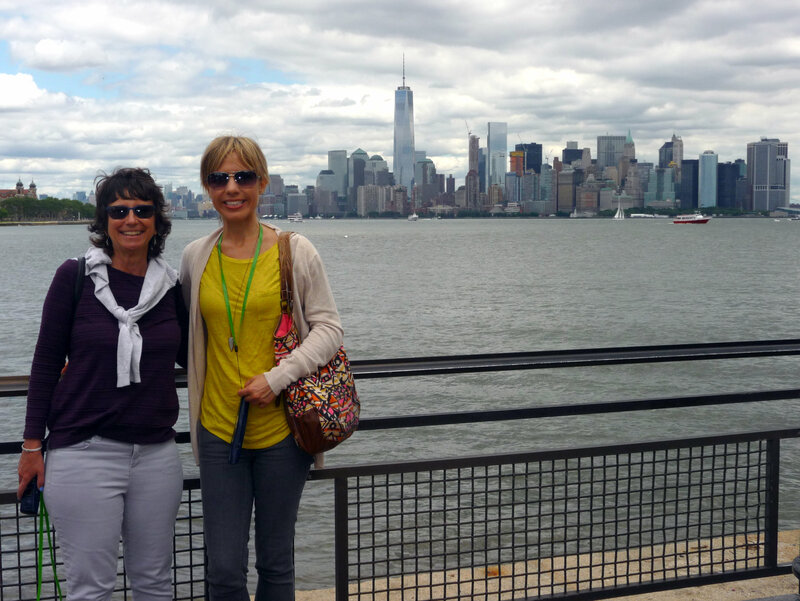 We spent some time walking around both of the basins then started heading toward our next destination: Battery Park. 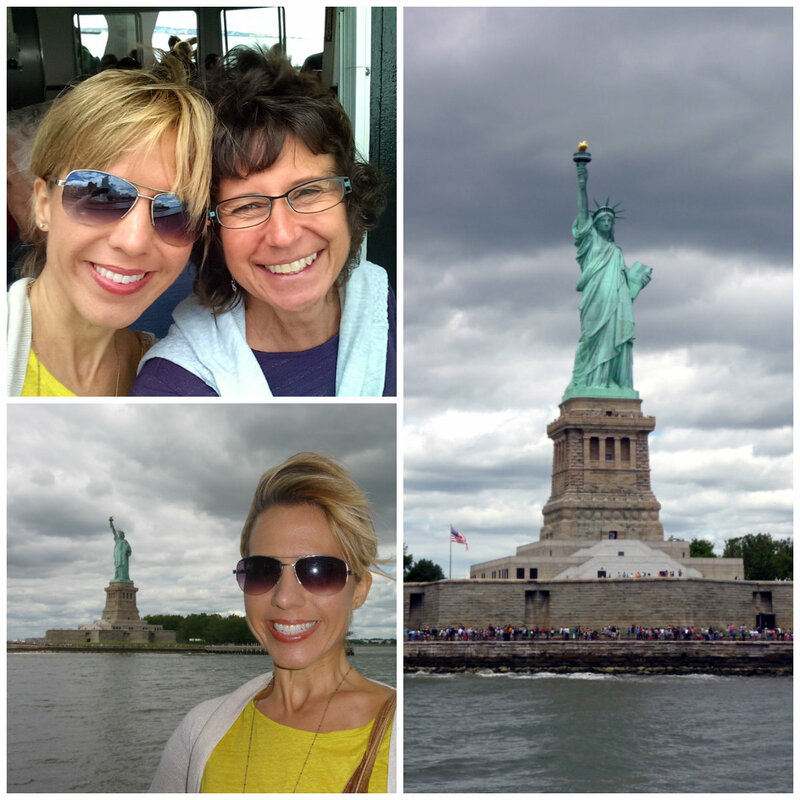 We had purchased tickets to the Statue of Liberty and Ellis Island prior to our trip and had a ferry departure time of 1:00. It was still early, so we leisurely made our way toward Battery Park via an absolutely beautiful scenic walk along the Hudson River and through South Cove Park. This area was so, so lovely! 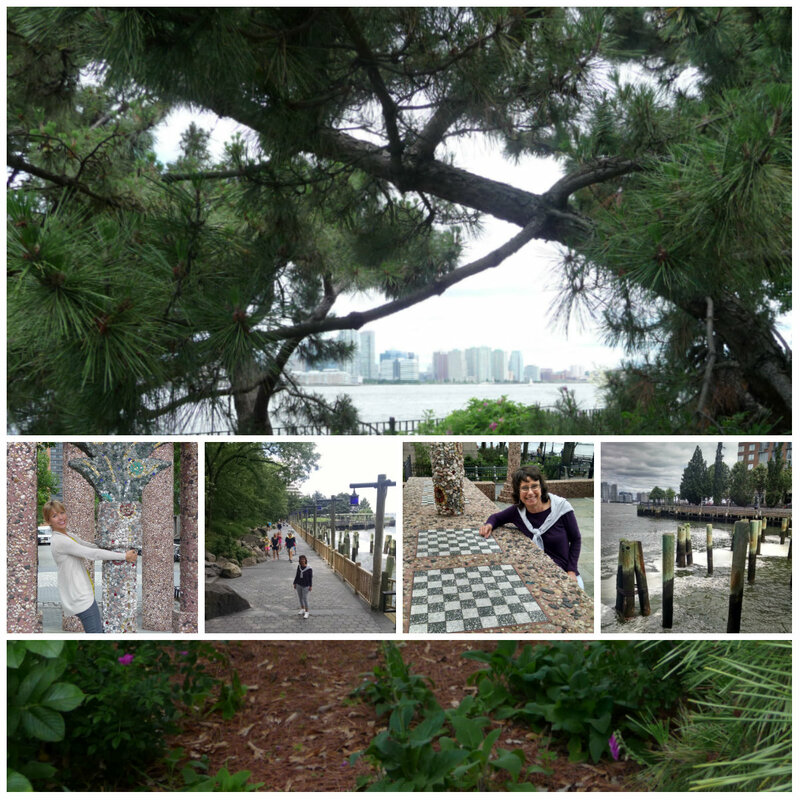 A wide promenade lined with shady trees, colorful flowers and many benches, with a view of Jersey City across the river. We thoroughly enjoyed this peaceful walk – especially in the lovely, cool weather! Although it was still early for our scheduled departure on the ferry, we decided to head on over to the pier and see if we could get on a bit earlier. This place was crazy!! 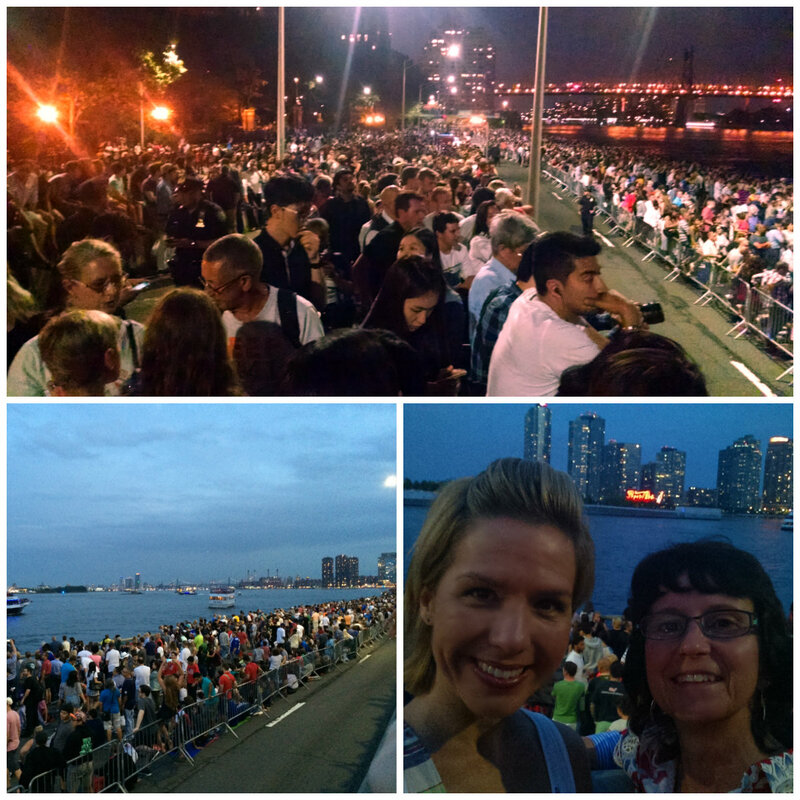 So many people and insanely long lines! But, (important tip here!) we were able to bypass ALL of it because we had pre-purchased our tickets online! Score! We were through security and onboard a ferry in ten minutes. Yay! The ride to Liberty Island was very nice, the Statue of Liberty becoming larger and larger as we neared. As soon as we were on dry land, we picked up audio guides and started walking around the island. We actually didn’t use the audio guides much but just wandered around on our own. One of the things I loved the most about being on this island was the view of Manhattan. I couldn’t stop taking pictures of the dense population of buildings across the river! Ever more spectacular views from this vantage point. My favorite views of the statue itself however were from its star-shaped foundation which is where I headed next. 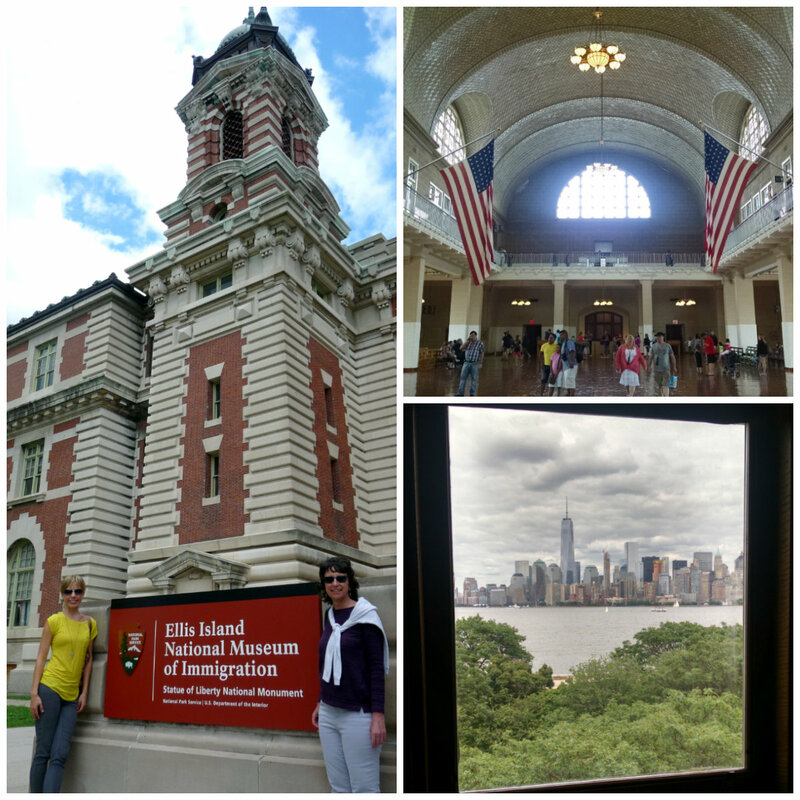 Next stop on our little tour was a trip to Ellis Island. This small island contains the building where immigrants to the U.S. passed through from 1892 – 1954. It was later listed on the National Register of Historic Places and reopened its doors to the public in 1990. We walked through various rooms and exhibits and watched a 30-minutes film, Island of Hope, Island of Tears, which was actually very interesting. I love history and really enjoy visiting places like this! Leaving Ellis Island, we made our way back to Lower Manhattan. We had decided to eat dinner in the city before heading back to Queens but had no idea where we wanted to eat. I think it would probably take ten lifetimes to eat at all of just the good restaurants in this city! The dining options can be pretty overwhelming! We finally decided to go to Eataly since it was on our list of restaurants to try and had been recommended to us by numerous people. Great choice! Eataly, created by Oscar Farinetti, is an overwhelming (in a good way!) foodie mecca. It’s one of the largest Italian markets in the world and is comprised of a variety of restaurants as well as retail shops, bakeries, food and beverage counters, a cooking school and…a Nutella Bar. What?!? It was actually a bit confusing for someone who has never been there before and doesn’t know how it “works”. But we finally figured it out and decided that pasta was what we were craving so we headed over to La Pizza & La Pasta. We were seated at the counter that extends along the open kitchen which we really enjoyed. I found it completely crazy how fast the cooks work and how they can keep track of all the dishes they’re creating without skipping a beat. It was truly fascinating to watch! I ordered the simplest sounding dish on the menu: Spaghetti Cacio e Pepe (spaghetti with cheese and black pepper). And it was seriously one of the best pasta dishes I’ve ever eaten. So, so good. Georgann had Tagliatelle al Ragù di Manzo (tagliatelle with short rib ragù and parmesan) which was also quite tasty. Although I would have loved to try one of the house-made gelatos, or some fresh pastry, or gourmet chocolate, my stomach wouldn’t allow another morsel to enter it this evening. We both agreed to make a point to return to this crazy market but never made it back. 😦 Next visit I guess. 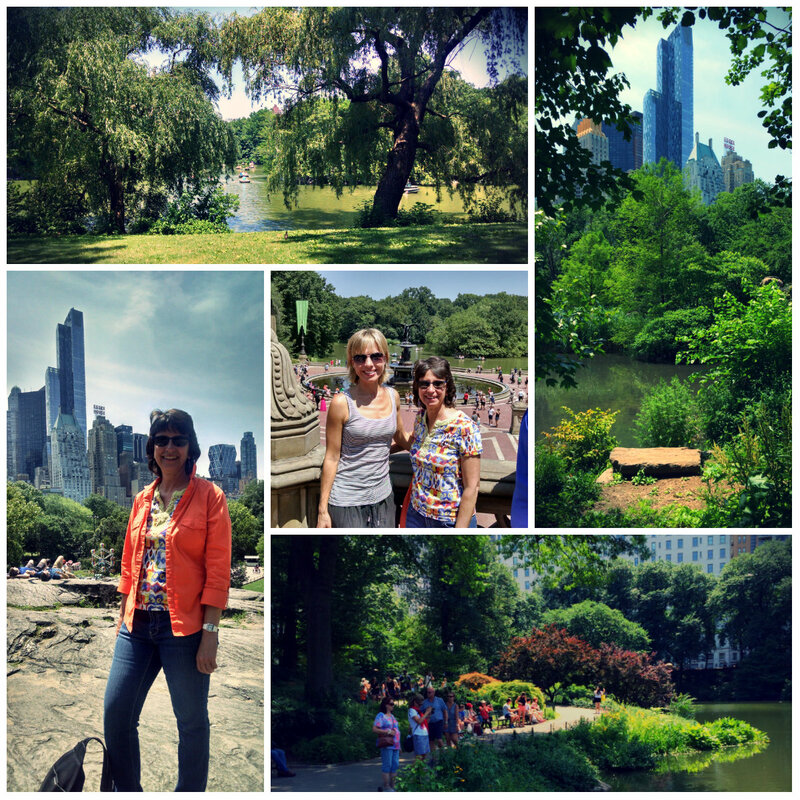 Our first full day in the city was, well, full! 🙂 And wonderful. We purchased 7-day unlimited subway passes for our time in Manhattan. We hadn’t really researched all of the options prior to us standing in front of a ticket machine holding up the line, so we just made a spur-of-the-moment decision. I really think we made the best decision as we didn’t have to worry about refilling the cards and we took the subway a lot! The 7-day unlimited pass is currently sold for $32. There is a museum at the 9/11 Memorial that I’ve heard is really good. When you purchase tickets, however, you have to pick the date and time you’d like to visit, so that can make a last minute decision to go kind of hard (unless they’re super slow and you can enter right away – which I hear rarely, if ever, happens). The current rate for adults is $24. 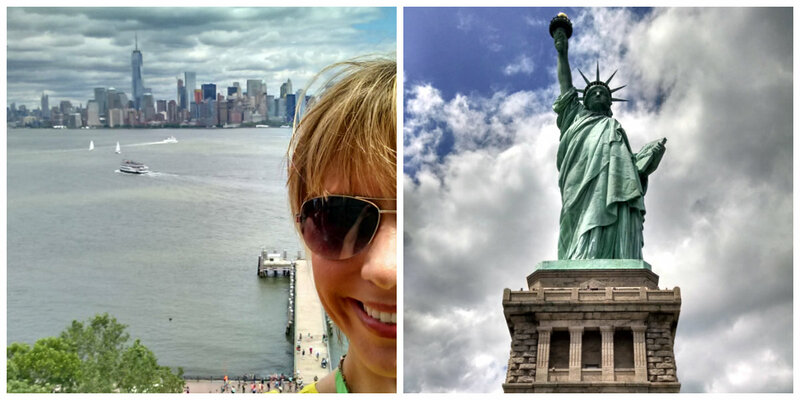 Visiting the Statue of Liberty and Ellis Island weren’t necessarily at the top of my list of things to do in New York but I’m very glad we decided to visit! Being up close and personal to the statue was really neat and, as mentioned before, I love history so Ellis Island was also interesting to me. The only way to get to Liberty Island is by ferry and tickets include the ferry ride to both islands as well as entrance fees. The price of a ticket varies based on the type of ticket you purchase (if you want to go up the statue and if so, how high). When we arrived at the pier around noon, all of the tickets to go up the statue were already sold out for the day. So if you want to experience that option, definitely purchase tickets in advance! That will also save you a LOT of waiting in line! Tickets can only be purchased through Statue Cruises and start at $18 for adults. 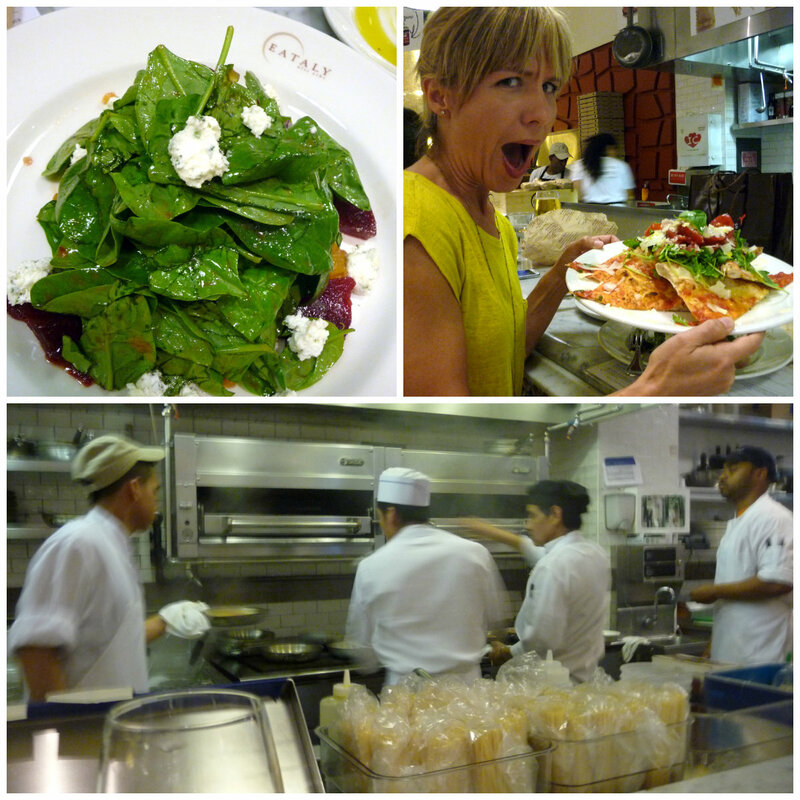 Eataly is a must for anyone visiting New York!! I can’t tell you how many people told us we should go there! Give yourself plenty of time to walk around this massive complex – there is so much to see! They provide guides/maps that can help you navigate the craziness a bit. There are seven restaurants to choose from but only three accept reservations. If you don’t want to sit down, there are also some counter-service options. It’s an experience, to say the least, and I wish we had had time to visit again and explore some more! After our adventures in Canada last year, my aunt, Georgann, and I decided to take another trip together this summer. And our travels have taken us to New York! 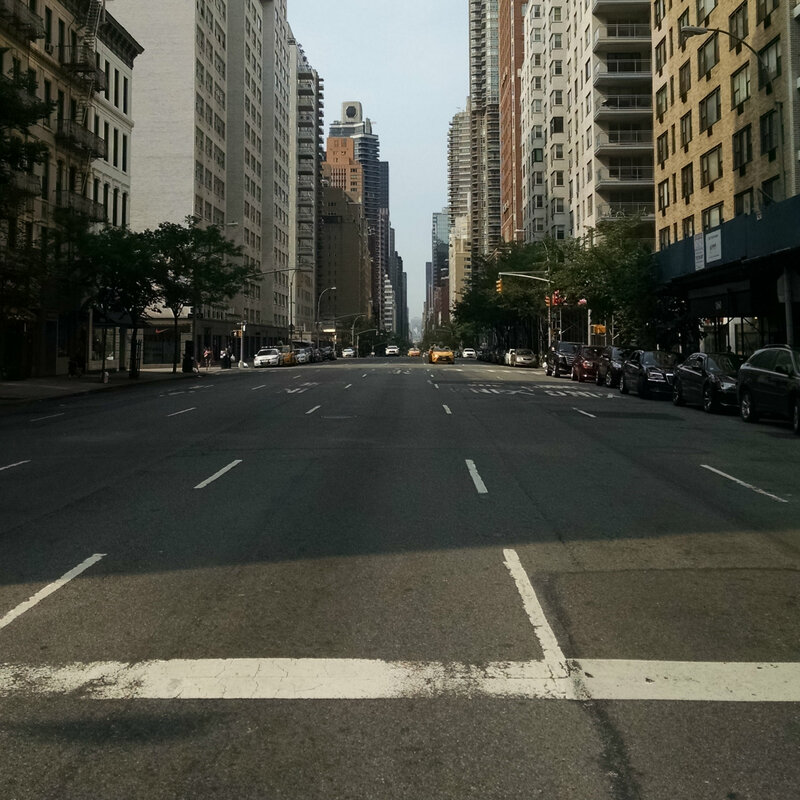 It’s been over fifteen years since I last visited the city of New York – way too long! 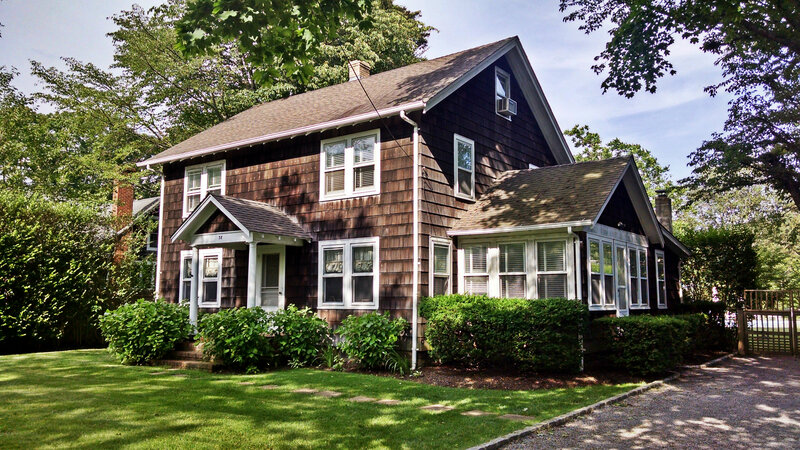 One of my grandma’s best friends, Maxine, lives here and also has a home in East Hampton. When I saw her at my grandparents’ house last year, she graciously invited myself and my aunt to visit her anytime we wanted. We couldn’t pass up that invitation so we started tentatively planning a summer trip up here. 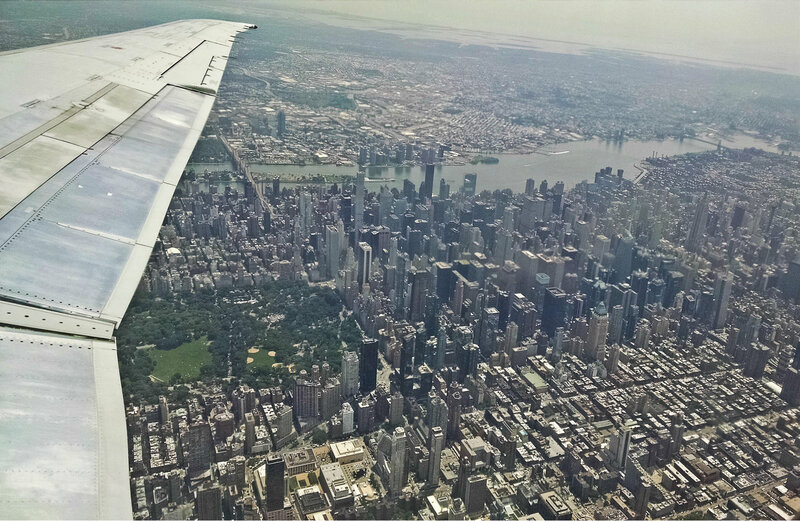 We arrived last Thursday and flew over Manhattan on our way to LaGuardia. Can’t wait to be down there exploring! Once on the ground, we immediately started making our way to the Hamptons with Maxine. Such a lovely drive (other than the traffic). I’m not sure about other people, but when I think of New York, my mind immediately goes to the city – high-rises, people, traffic… But venture outside of the city and this state contains so much natural beauty! I discovered this first in the Niagara region last year and now here, in and around the Hamptons. I love it. We arrived in East Hampton around 4:30 and drove through town and to Main Beach for a quick look before heading to Maxine’s beautiful 1920’s home. When we arrived, one of her daughters and her family were there as well. We all freshened up a bit then headed to dinner at Fresno Restaurant – a lovely place in town with a beautiful outdoor dining area. We enjoyed a wonderful meal and I especially enjoyed the Moroccan-inspired salmon I ordered. Theater time! Maxine had made arrangements for tickets to see the play All My Sons starring Alec Baldwin and Laurie Metcalf at Guild Hall. We had great seats in the small theater and the play was really, really good with superb acting! Such a lovely way to start our time in East Hampton! We had a lazy Friday morning, eating breakfast on the back porch and enjoying the surprisingly pleasant weather. The forecast prior to arriving had gloomily predicted rain all weekend but we didn’t see a drop of it until Saturday evening! 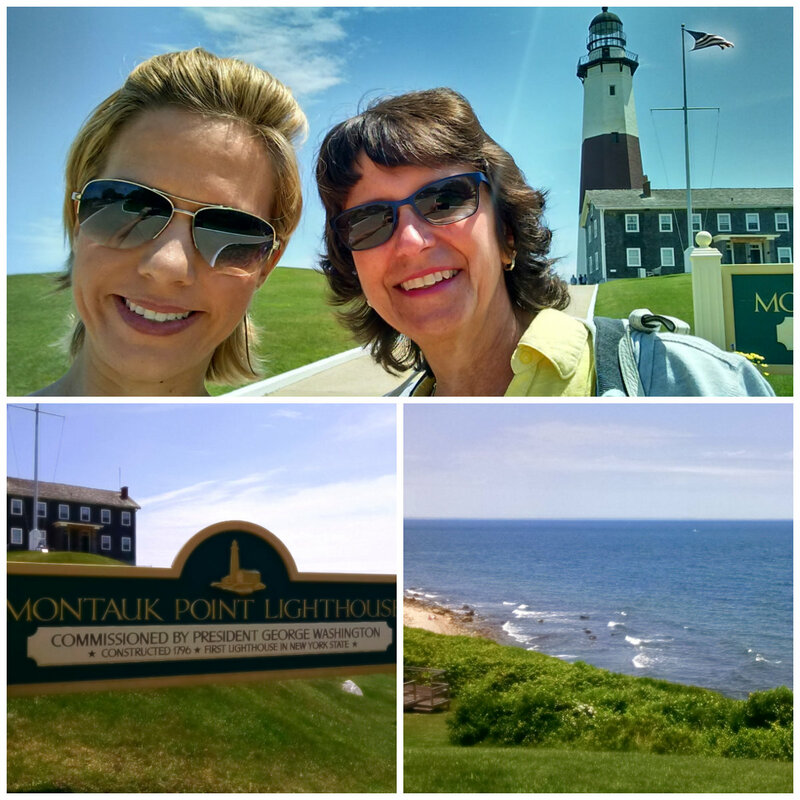 Mid-morning, we piled into the car to drive to Montauk – a town about thirty minutes from East Hampton. The main attraction there is the Montauk Point Lighthouse. I don’t believe I’ve ever visited a lighthouse before so I was excited to go up to the top of this one. This lighthouse, a National Historic Landmark, is located in a beautiful setting with gorgeous views. 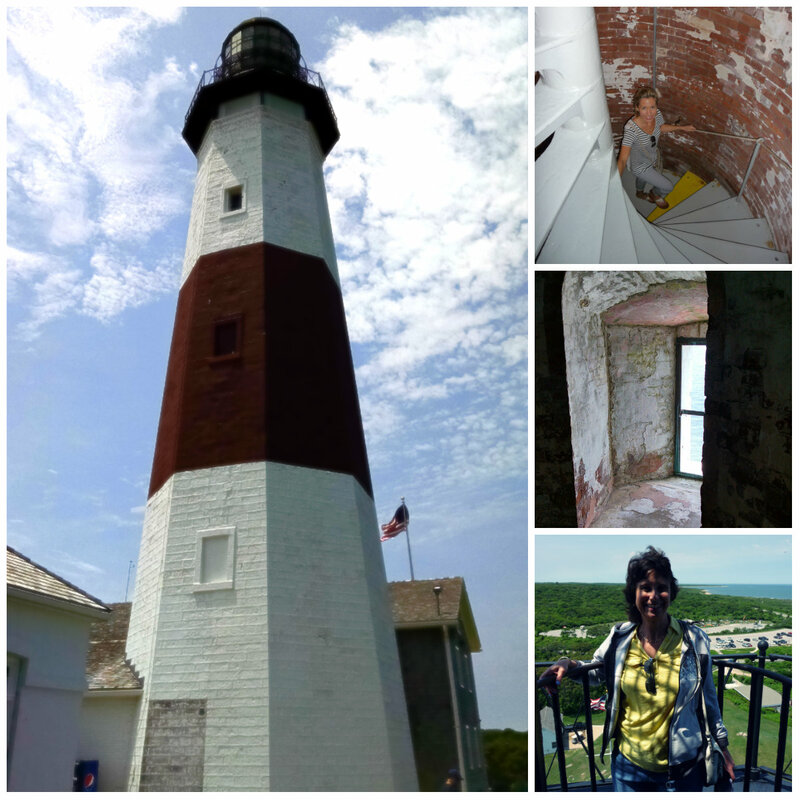 It was constructed in 1796, was the first lighthouse built in New York and is the fourth oldest active lighthouse in the United States. Georgann and I took the 137 steps up the spiral stairs to the light at the top. There wasn’t a lot of room up there and only one person at a time could climb up to the very top, but it was still really neat and if I lived in a lighthouse, I would spend most of my time at the top of the tower enjoying the beautiful views. From there, we drove to Gosman’s Dock – a little shopping and dining area where we wandered through some stores then picked up clam chowder at the Clam Bar. 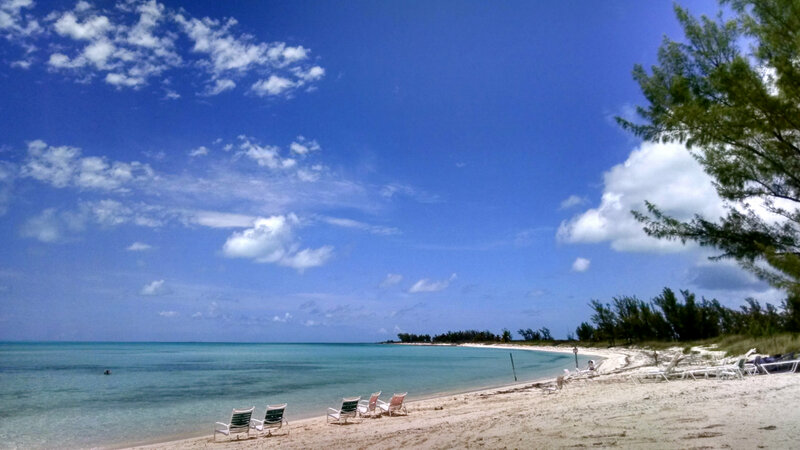 After our lunch on the docks we headed home where we grabbed some beach chairs and drove to Main Beach. Although the sun was shining this day, it was still a bit cool and breezy. But once on the beach, I actually warmed up enough to lay out for a bit. Yay! We stayed there for a couple of hours then headed back to the house to get ready to attend Sunset Friday at the Wine Stand at Wölffer Estate Vineyard. 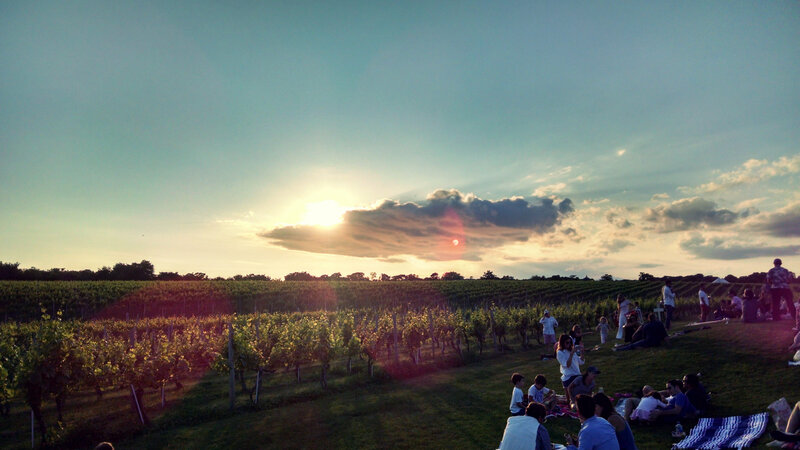 Every Friday evening during the summer, people bring lawn chairs and blankets to lay on the grass, buy some wine, and enjoy live music and the great outdoors. It was a very lovely way to spend the evening and the sun setting behind the vineyards provided a stunning backdrop. We got back to the house around 8:30 and dinner was ready around 9:00. We enjoyed eating fresh fish we had picked up in Montauk along with some yummy veggies. The following day, Saturday, started in a most lovely way – yoga! 🙂 One of Maxine’s other daughters who had arrived the day before invited me to join her at a local studio for a class. 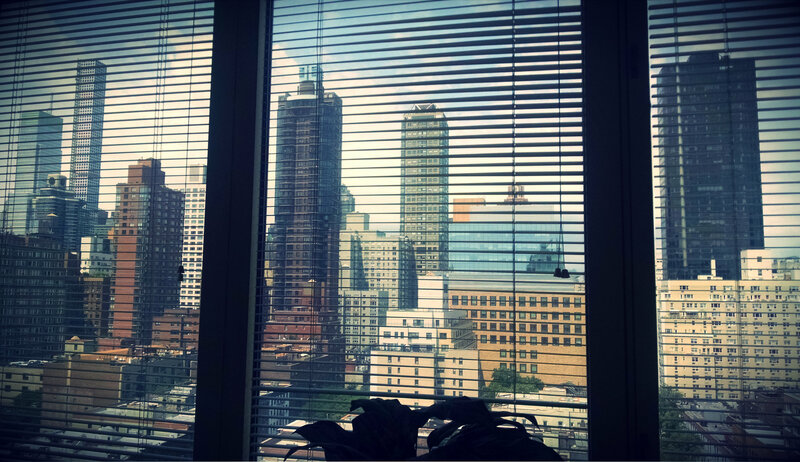 It was a packed class but wonderful – perfect way to start the day! 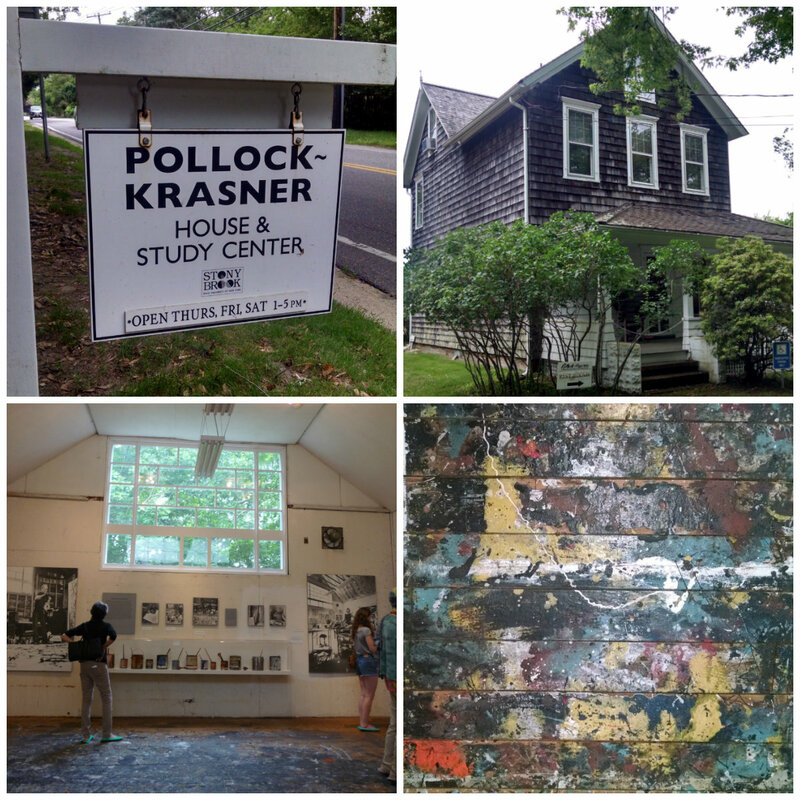 Later that afternoon, a few of us drove to Jackson Pollock’s house and studio. We toured his barn studio first and it was really neat to see the wood floor still covered with paint. Next we walked through his home where his widow, Lee Krasner, lived until her death in 1984. We had planned on visiting the gardens at LongHouse Reserve but it was closed due to a private function. 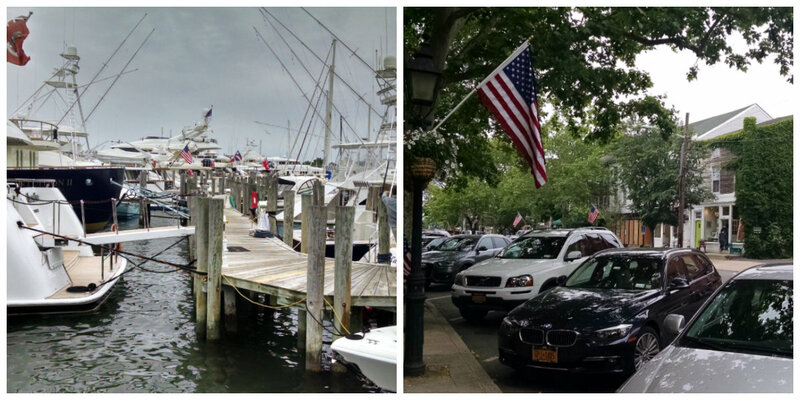 So instead we drove to the town of Sag Harbor where we parked the car and walked along the marina and through the village. The weather was turning a bit gloomy at this point so we headed back to the house to prepare dinner. Another lovely meal was followed by a lazy evening of reading and writing. The rest of the morning and afternoon was spent walking through town, taking one last trip to the beach, and repacking for our return trip to the city. Soup dumplings are dumplings with soup in them. You bite a little hole in the dumpling, slurp out the soup, then eat the dumpling. I was pretty fascinated. Dinner brought an end to our wonderful time with Maxine’s lovely family. 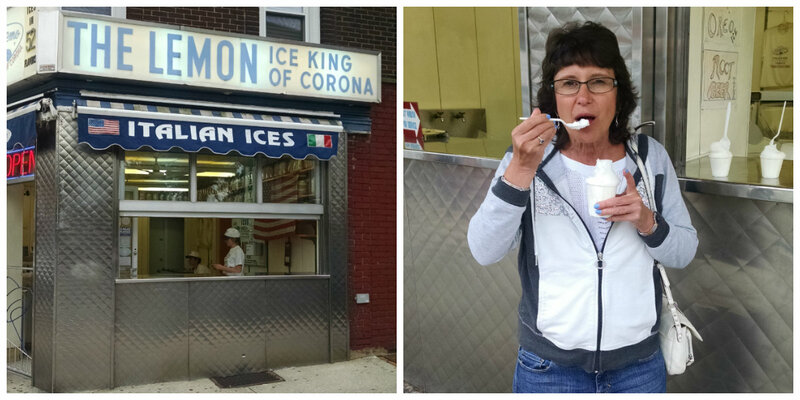 We bid adieu to them then made a quick stop at the Lemon Ice King of Corona for some lemon Italian ice on our way to Maxine’s apartment. Next stop: Manhattan! 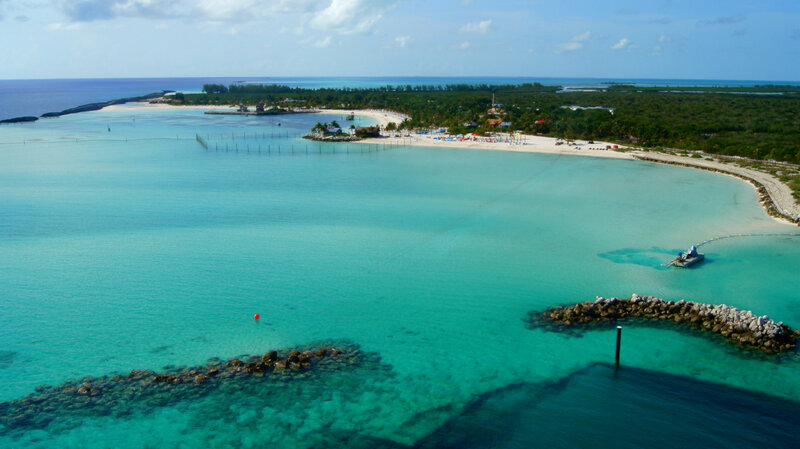 I have visited Castaway Cay twice on previous Disney cruises and I must say, it is always a highlight of my trip! Disney purchased (well, leased actually) this Bahamian island in 1997 and went to work making it a true tropical paradise. There isn’t a lot of development on the island which makes it that much more wonderful. This being the final full day of our 7-day Caribbean cruise (*tear*), we wanted to take advantage of every opportunity and pack in as much as we could! Our morning started with a very light breakfast of…bananas. 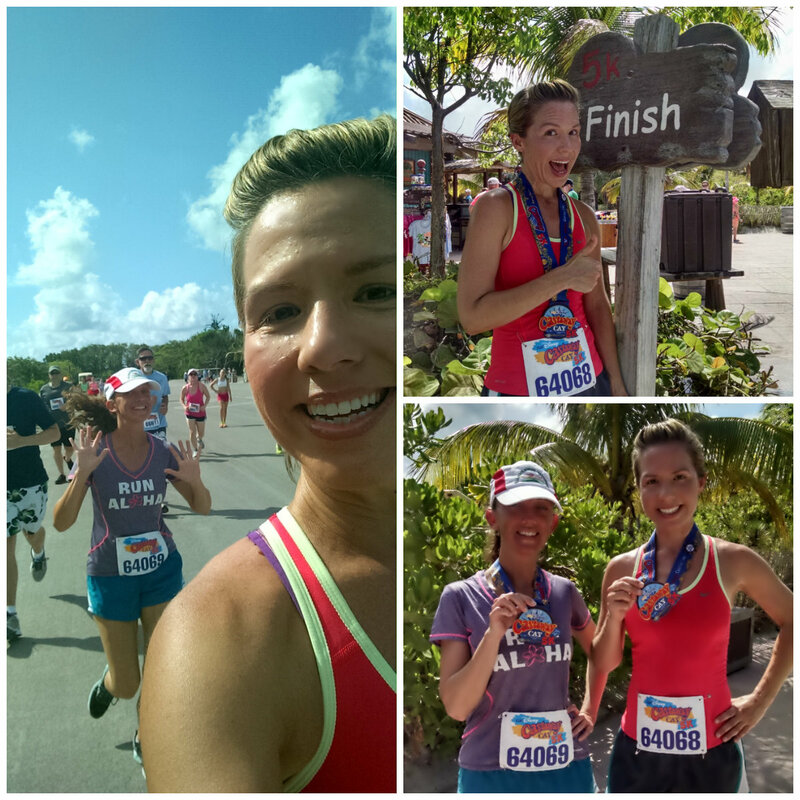 Teresa and I had signed up for the Castaway Cay 5k and had to meet up with the rest of the runners at 9:00. We finally made it to the start line, stored our bags in a bin, and waited a few minutes for the horn to blow, signaling the start of the race. The course ran through some tropical foliage, along the unused airstrip, and around the bike trail. Not much shade anywhere and although it was only a 5k, it was really challenging in the heat. I poured water over my head at each hydration station I passed trying to cool my body down a bit. We were just a little bit excited (or a lot) to finally cross the finish line. And we were really excited to receive a finisher’s medal! Neither of us had expected to get anything for running this free race. Score! We met up with Teresa’s mom and spent some time in the shade stretching and trying to cool down a bit. 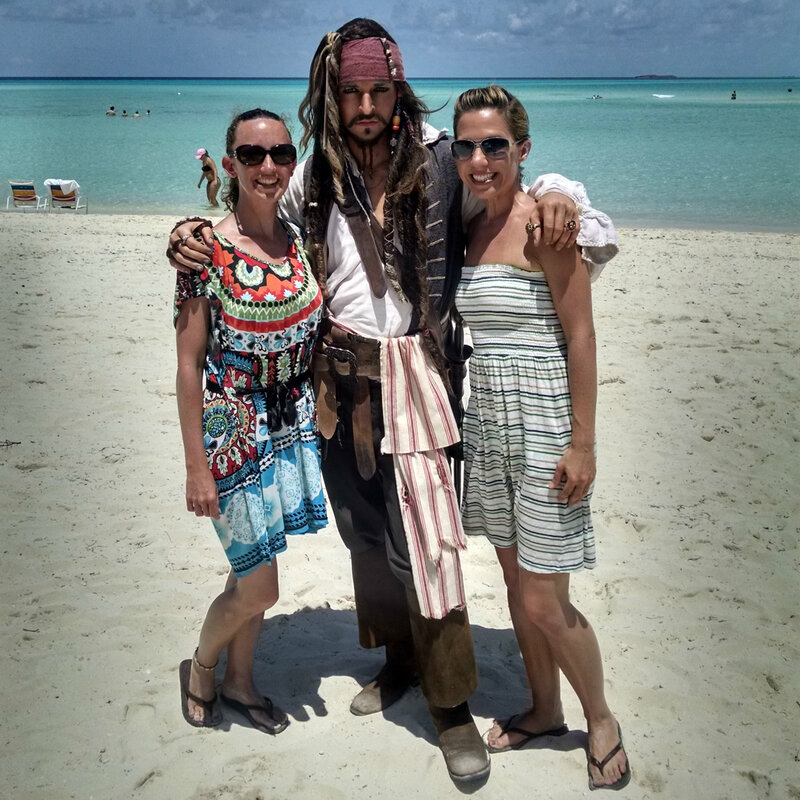 Once we felt the life returning to our bodies, we jumped on a tram that took us to Serenity Bay – Castaway Cay’s adult-only beach. At this point it was close to 11:00 and we had to walk to the end of the beach before finding free lounge chairs. By the time we had settled in to our little beach oasis and tested the water temperature (cold! ), it was 11:30 and the lunch buffet was open. Teresa and I were both really hungry after our earlier sort-of-breakfast and run, so we both made a bee-line for the outdoor buffet. We waited in line and filled our plates – I, in my extreme hunger, selecting a hamburger (what I nearly always crave when I’m really, really hungry). It was all actually pretty tasty (our crazy hunger might have helped with that critique) and I absolutely loved the variety of fresh, tropical fruit that was offered. 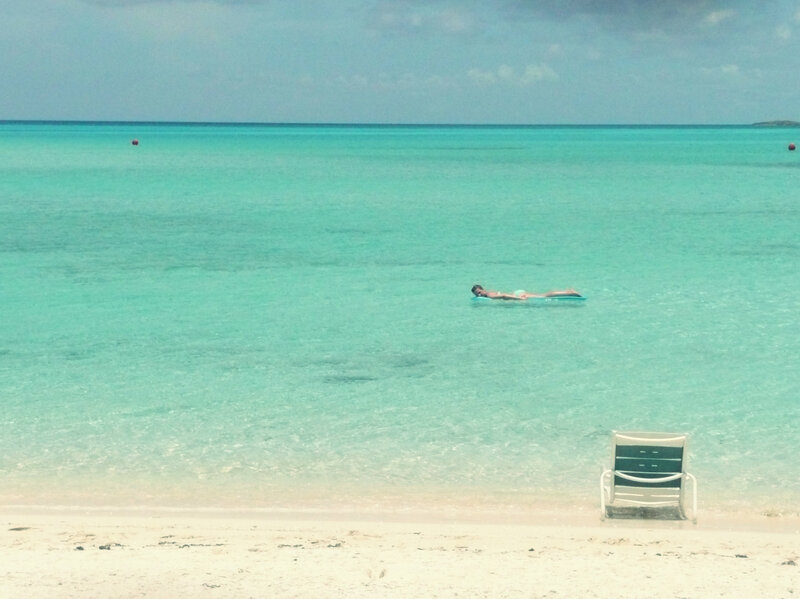 Once back at our lounge chairs, we laid out for a bit, then I dragged the float I had rented into the water and nearly fell asleep floating on the gentle waves. This is the way to lie out! Seriously. So, so lovely. While I was floating along, I saw something dark sitting on the ocean floor. The water was crystal clear and it was very easy to see anything in it. I dove down and picked up the object which turned out to be the biggest starfish I’ve ever seen! 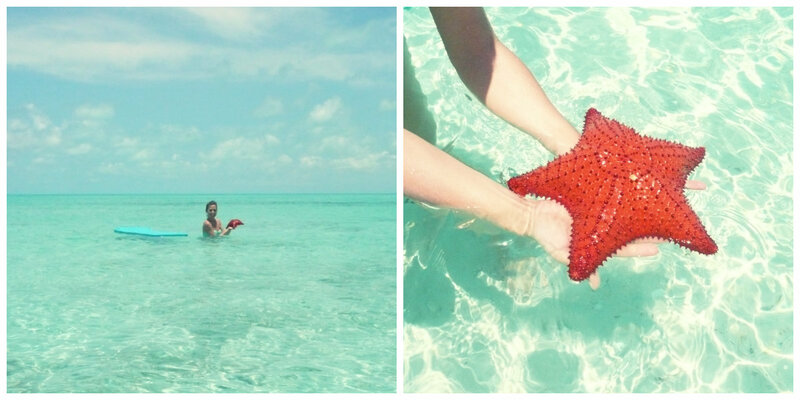 Actually, I’m not sure I’ve ever seen a starfish in person before! It was pretty heavy but I managed to swim to shore holding it and my float. It was so cool! The longer I kept it under water, it’s arms would relax and drape over my hands and it’s suction cups (I have no idea what the scientific term is for those 🙂 ) would suction to my hand. I brought it to shore so Teresa and Karen could see it, then swam back out to the deeper water to lay it on the ocean floor again. Teresa and I swam to a large sandbar and discovered even more marine life – live sand dollars, colorful fish and multiple stingrays. One stingray swam right up to us as we stood frozen in the sand. Right before I was about to suggest to Teresa that we make our escape from this apparent attack stingray, it lowered itself to the ocean floor and flipped sand over it’s body until it was completely covered – just it’s tail still visible. So neat. We spent the rest of the afternoon floating in the sea, laying on the lounge chairs, reading, dozing off, and just enjoying the serene beauty and views. 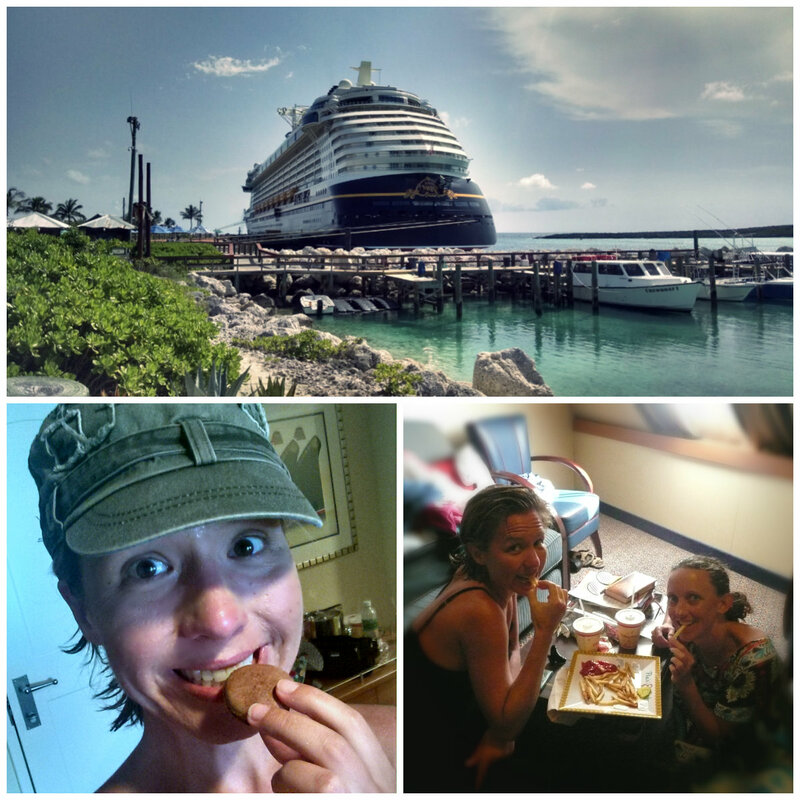 Our day on Castaway Cay ended too soon but we had to get back to the ship to get ready for dinner. 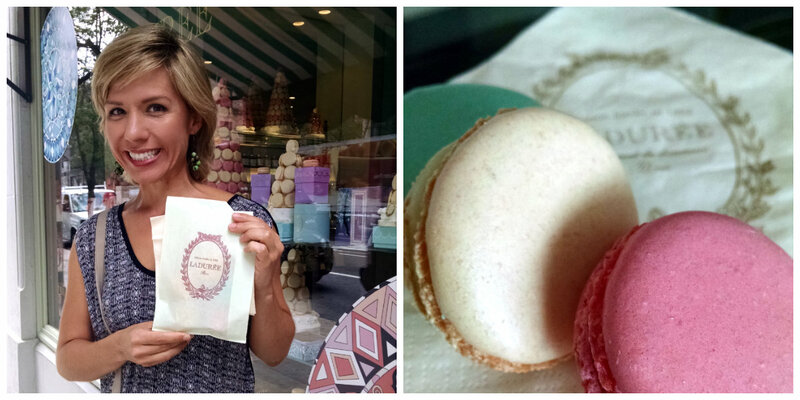 As soon as we were back in our stateroom I broke into the macaroons I had received the day before. Yum!! And when I got out of the shower, I was delightfully greeted with a plate full of fresh french fries. I had been craving them for lunch but they weren’t available on the island. 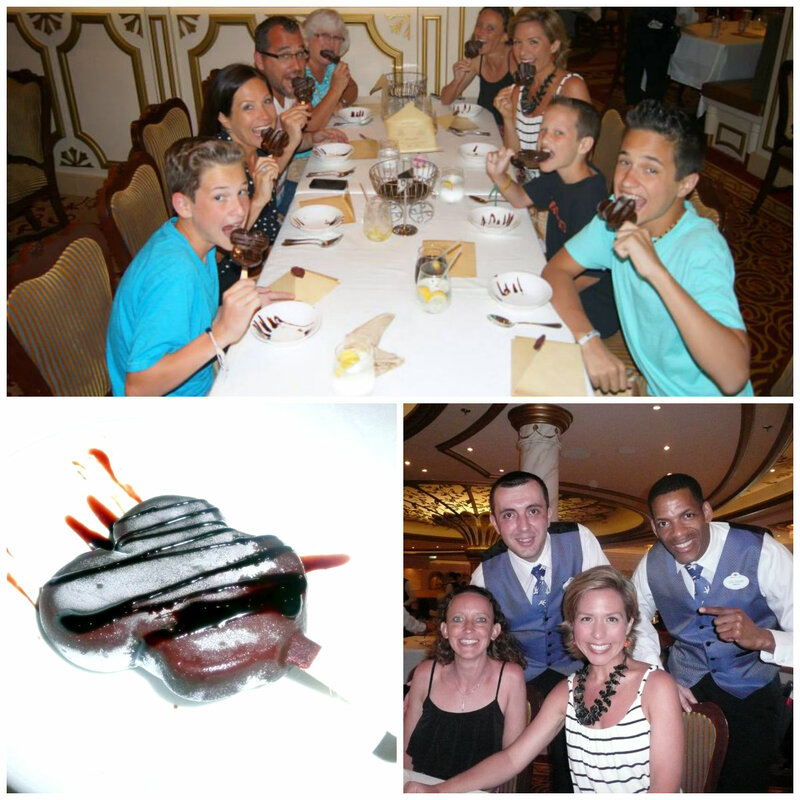 After we returned to the ship, Karen so sweetly went to the buffet and surprised Teresa and I with these yummies. And then we each ordered a dessert off of the menu. Of course. We had some time between dinner and the final production at the Walt Disney Theater so we went outside and took pictures of the beautiful sunset. 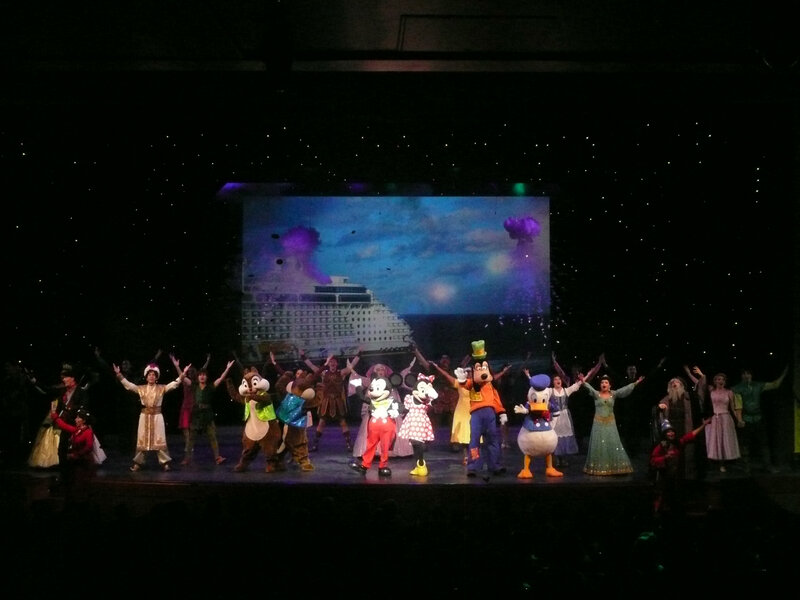 The final show, An Unforgettable Journey, was the shortest one yet but was a nice farewell from the entertainment cast. The following morning we woke up early to make our assigned 6:30 am breakfast. Not cool, Disney. Not cool. After breakfast we bid farewell to the Fantasy and disembarked for the final time. 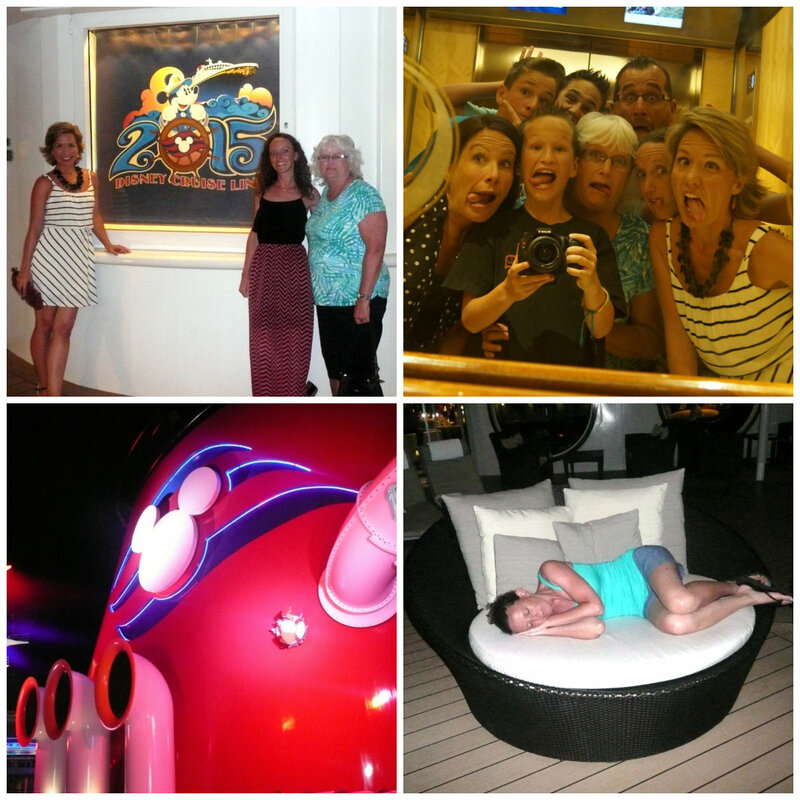 These seven days at sea were so enjoyable and just what I needed to relax and unwind! 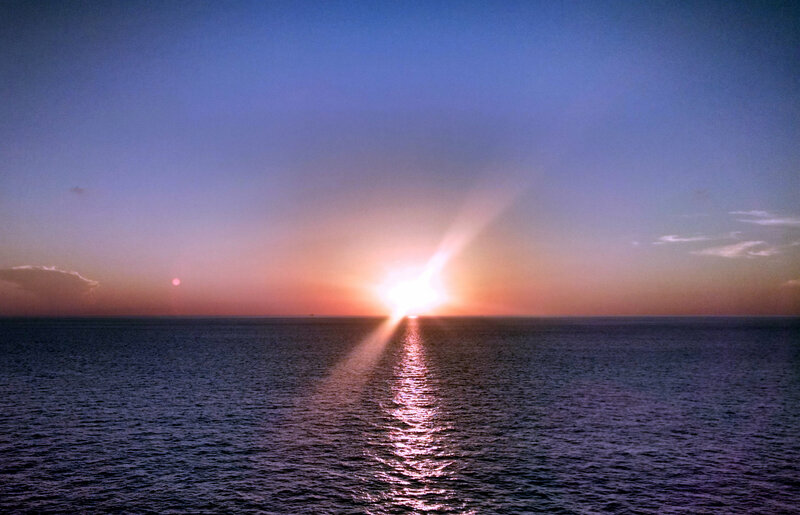 I can’t wait for my next cruise!